Rusin Acenov is an assistant professor of Bulgarian Language at St. Cyril and St. Methodius University in Veliko Tarnovo, the city of the Tzars, in north central Bulgaria. Rusin started school in a segregated Roma school within the Roma neighbourhood of Vidin. Despite this initial isolation from mainstream culture, Rusin believes he received a good education. 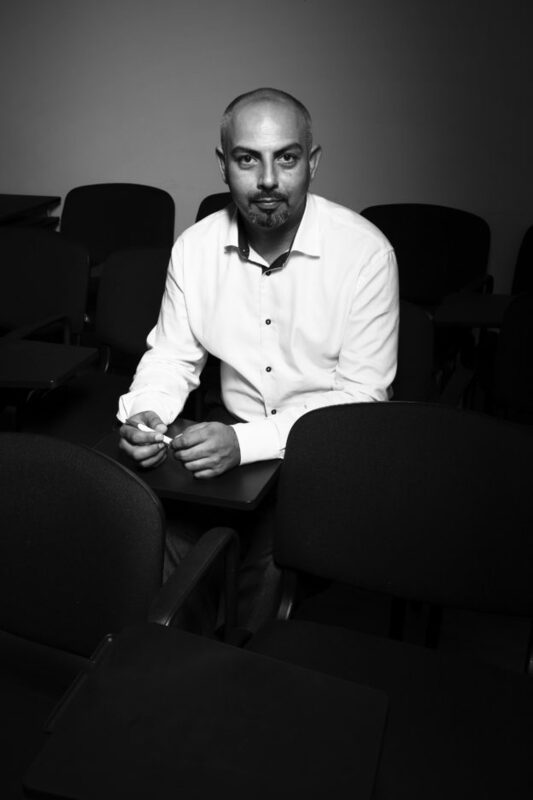 In part he credits a project organized by local teachers of Roma background, Know Your Origins, which educated students in the complexity of Roma culture and language, for motivating him to pursue post secondary studies. In high school, Rusin became intrigued with the roots of the Bulgarian language. He recited poetry in Bulgarian at several school-sponsored events and presented traditional Bulgarian folk tales and legends on Vidin's Roma TV station. "These experiences developed my confidence in speaking before an audience." While pursuing his undergraduate degree, Rusin worked as an assistant coordinator in the Roma education branch of Amalipe, the Center for Interethnic Dialogue and Tolerance, funded through the America for Bulgaria Foundation. Amalipe invited Rusin to interview Professor Hristo Kyuchukov, a specialist in intercultural education, in conjunction with the NGO's mission to integrate and modernize the Bulgarian Public Schools. Rusin credits Professor Kyuchukov's encouragement and guidance for his decision to continue post-graduate studies in linguistics and to consider academia as his future career path. Rusin obtained a masters degree in Bulgarian linguistics and philology. His master's thesis topic: Comparison between Bulgarian and Romanes, with special attention to the Kalajdži Romanes dialect, demonstrated that Kalajdži Romanes is a dialect related to the larger family of Balkan languages including Bulgarian, Albanian, Macedonian and Serbian, which cross Indo-European language families but share grammatical structures such as case declinations and verb conjugation. Rusin's interest in the many dialects of Romanes springs from his own background. His father speaks the Kalajdži dialect, while his mother speaks Tsutsumani, one of the Old Vlax group of dialects spoken by traditionally nomadic Roma in several nations of Eastern Europe and the Americas. In May 2016, Rusin was awarded a Ph.D. His dissertation "The Bulgarian language as a System of Metaspeech in Internet Communication," received high praise for its innovative examination of the place of Bulgarian in the global growth of 'metaspeech' an amalgam of written and oral language with its own modalities, which spans languages and cultures in Internet communication. Rusin is only the second scholar of Roma ethnicity to obtain a Ph.D. in Bulgaria. "To be Roma and a professional means constantly working harder and smarter to earn respect." "I have known I wanted to be a doctor since childhood", Miroslav Angelov Angelov told us in a lecture hall at the Department of Neurology within the Alexandrovska Hospital in Sofia. This poised young man, only 31 years old, is preparing to become a cardiologist. Miro received a Bachelor of Science from the University of Sofia and is currently in his fourth year of graduate medical studies at the Tsaritsa Yoanna University Hospital. Specialist training in cardiology will begin in his sixth year. His studies began here at Alexandrovska Hospital, which he refers to as the "wellspring of Bulgarian medical training." The impetus for Miroslav's decision to become a cardiologist was the death of his mother of a myocardial infarction (heart attack) when he was only nineteen. 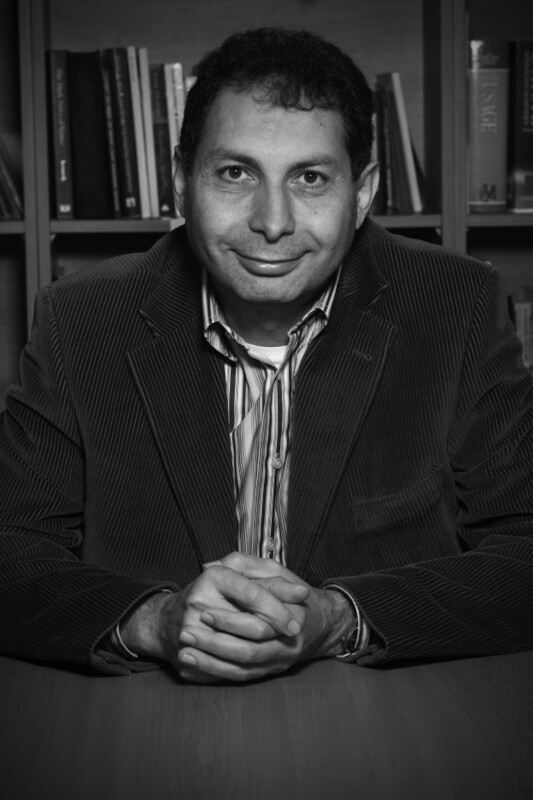 Many professors have encouraged him, but Miro cites as his greatest inspiration Professor Ivailo Tournev, specialist in the field of neuro-genetics, who has devoted his expertise to bettering the health and wellbeing of the Bulgarian Roma. Miroslav is aware that he a role model for young people, particularly Roma youth. "In five years I see myself working as a cardiologist in Bulgaria and seeking the best outcomes for all of my patients." When asked how he plans to accomplish this goal, Miro replied, "hard work and self-discipline." These are personal qualities this future cardiologist has in abundance. Stela Angelova, just 26 years old, has been a social worker with the Social Assistance Directorate: Child Protection Department in Sofia since attaining her M.A. in Educational Psychology. "It was my luck to find this job - this is my mission." Stela works with the police, court services, NGOs and health care workers to support families who are having difficulty caring for their children. She makes home visits, and serves children in need on an emergency basis. As much as possible Stela tries to keep children with their parents, yet some must be placed in national institutions because of abuse or violence. "To make real change in family crisis situations, the entire community must be involved." Although the majority are children of the poor, children in need come from all social classes- "the rich can also cry." Some children have special education needs but the Bulgarian school system does not have programs for them. "My parents did not have the opportunity to attend university, but they always encouraged me to pursue higher education. Being Roma is not the basis of my motivation. I am a human being and can see the problems that need to be solved. My colleagues are not Roma, yet like me they work with Roma families from their hearts. This is a really hard job, but I'm young; I'm going to see the change." Biser Asenov was born in Vidin in North West Bulgaria near the Romanian border. He credits his family with motivating him to continue his education and seek a sustainable career. "My mother, father, older brother Denis, and my grandparents have offered support and sought out opportunities to allow me to reach my goals." Biser's father, Asen, is a social worker in Vidin; his mother, Mariana, a dressmaker. Biser attended the prestigious Tzar Simeon Viliki secondary school in Vidin where he excelled in biology. Biser was a member of the Areté Youth Foundation and attended leadership camps, Zaedno Napred, during his two final years at high school. Biser is beginning his second year studying informatics with an emphasis on coding at South West University, Blagoevgrad. "I chose this field both because I really love all aspects of computer science, and because it is a job with many openings in Bulgaria. I don't want to have to leave home in order to be able to pursue my career." Biser is the recipient of an REF scholarship, which requires him to work while in university. He plans to get a job creating and selling software. "I love creating software and I am good at marketing my ideas." Biser intends to get a foothold in the industry before attempting to start a business of his own. "I don't allow myself to be pushed into any decisions. Once I complete my undergraduate degree, I plan to continue to a masters', but I am not sure yet what my focus will be. I don't plan to marry and start a family until after I have finished my education and have a good job in my area of expertise. My plans and objectives will unfold as I progress. I will establish my base when I know I am ready." Denis was born and raised in the city of Vidin in far North Western Bulgaria. 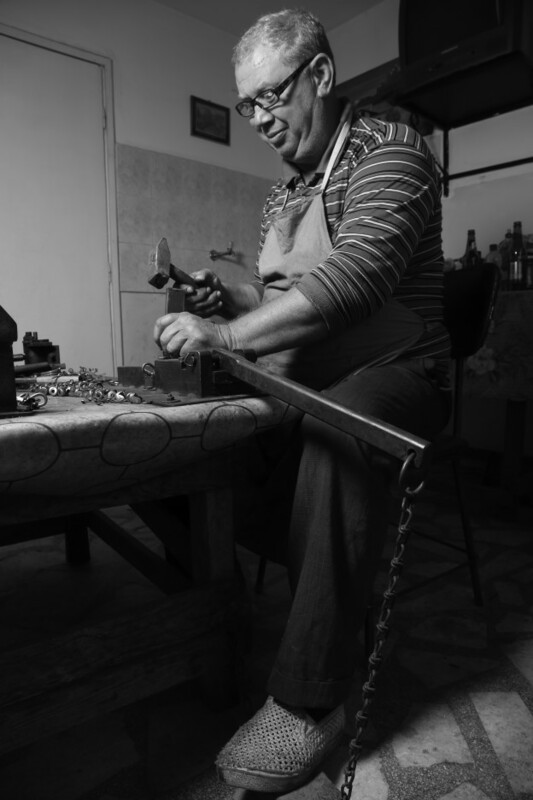 Denis' great grandfather moved from Turkey to Vidin a hundred years ago to open a tack shop. The shop, manned by the extended family, was able to expand into selling a variety of products made of leather, in addition to bridles and harnesses needed by local farmers. Denis' father, Asen, and mother, Mariana, still live in Vidin where his father is employed as a social worker. Denis and his younger brother, Biser, both moved away to attend university. Denis now lives and works in Sofia. Denis attended an integrated high school in Vidin. With his ability to readily grasp abstract concepts, and a willingness to explore every avenue to reach a solution, Denis consistently attained high marks in mathematics throughout high school. He entered South West University in Blagoevgrad and completed a BSc in computer systems and technology in 2015. "My motivation is the need to break down stereotypes of Roma people as incapable of succeeding. This is what has pushed me to keep going in spite of difficulties I have encountered. If you are Roma, especially if you have darker skin, you must be better than the best to succeed." Out of one hundred and fifty graduates of the class of 2015, Denis is the only one working in the IT field in Bulgaria. Some have moved to Western Europe, but many are working at entry-level jobs. Denis is currently a sales assistant with an international IT company specializing in repairing software glitches in computers and smart phones. Denis cites his internship at the U.S. Embassy in Sofia as a key accomplishment to date. "I was in IT support. There were six IT guys supporting five hundred computers." Although he would like to remain in Bulgaria, Denis realizes his long- term goals may impel a move at some point. His short-term plans are to continue his current job until he has enough money to complete a master's degree in software technology. "I plan to work my way up to management while networking with the global IT community." Boyan Georgiev Avamov is Deputy Mayor of the town of Valchedram. He was born in the nearby town of Lom and graduated from law school in Varna. Boyan also has an M.S. in Public Administration. He, his wife and two small daughters live in Valchedram, while his older sister is Principal of a school in Knezha. Boyan's areas of responsibility include infrastructure projects, regional planning, and energy development. He is also chairman of a committee investigating crimes committed by minors. The committee works with psychologists, teachers and social workers who mentor youth during after school programs. If appropriate, the children are sent to special education. Children are referred by severity of the crime, not by their ethnic group. "In general, Roma kids are stealing to buy food/whereas non Roma kids are stealing to buy drugs." 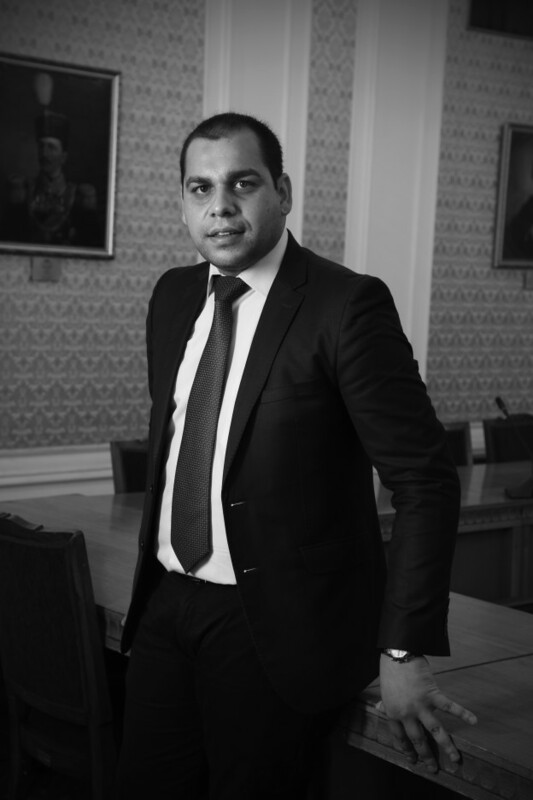 Boyan has been Deputy Mayor since his appointment by the Mayor four years ago. The first year as Deputy Mayor was very difficult. "I want to be an expert in my field and demonstrate my integrity." As Deputy Mayor, Boyan must have critical decision making skills. When the mayor is not available, the Deputy Mayor must step forward. For example: Boyan established a Volunteer Fire Department to ensure that procedures for disaster preparedness are correctly put in place. "I'm not planning to run for Mayor," states Boyan. "The administrative team in Valchedram works well together, but the political situation in Bulgaria at present does not allow for progress. This village is unincorporated because we are following our own direction, and are not supported by GERD- the political party in power. Therefore our village is poor. I would like to be remembered as a Deputy Mayor who served the people of my community." My children should have the chance to reach the highest level of Maslow's hierarchy of needs- self-actualization. The fact that they are Roma or that they are girls should not hold them back. Our community understands now what democracy is, and how to achieve it. We should not have to wait for others to catch up." Borislav Borisov is a legal advisor for the Montana Social Assistance Directorate in the Child Protection Agency. His major role is protection of children from abuse and violence. Social workers make home visits-then Borislav steps in, if necessary, to place children in crisis centers, meanwhile working with parents to determine their competence to care for their children. Borislav prepares all court and interagency documents regarding child placement. If the family is Roma, Borislav explains to the parents, in Romanes, what changes they must make in order to keep their children. "For example, I encourage families to let their daughters complete secondary school even if they are already married. Parents listen to me because I am also Roma." Borislav lives in the town of Montana with his wife, Zdravka, a teacher, and his two children- Reny age 9, and Peter, age 3. His mother, Reny, a social worker, lives nearby. Borislav lost his father, Pietr, last year. Pietr had championed the move for equal Roma participation in all levels of Bulgarian society. "I know I changed when my father died. Life is full of unexpected events which cannot be predicted." "I have always had the ambition to prove that the Roma community could attain as much or more than the non-Roma. The difficulties I have confronted have pushed me to aim for the highest goals possible. Achieving my goals happens one day at a time. I worked for three years at a law firm. I learned how to present my opinions in court and how to write legal briefs. Then I saw an ad for a lawyer with the Social Assistance Directorate; I applied and got the job. Now I am using that experience." "I am proud that I have taught my colleagues to be more sensitive to the Roma community. When I first started working here, if Roma people came in with questions, colleagues would say "Go away I'm trying to work." Now they realize that Roma are coming to the agency for help with problems not to bother anyone. In the past, social workers followed the letter of the law; now they follow the spirit of the law." "I hope that my children will have a better life than me with more opportunities. However I know that my children will face discrimination. The thinking in Bulgaria is that if you are Roma, you should only be working with a Roma NGO. Non-Roma have said to me, "you already have the SHAM NGO-why are you applying to a government agency?" I don't feel discrimination, but will I be able to move any higher in my profession? I would like to become a judge, but will I be able to?" "To be Roma in Bulgaria means having to prove oneself to everyone, all the time." Teresa Trifonova Borisova is a third year journalism student at Sofia University. She was born in Lom, but now lives with her parents and older sister, Biana, in Sofia. "I received a Roma Education Fund university scholarship which helped me to obtain an internship at Nova TV. My sister and I have always known that we have our parents' support of our educational and career goals." Teresa aspires to be a TV producer eventually; her short term goal is to become a TV broadcaster. "I will find my place in the media. I plan to get references from professors who I admire to advance my goals. Many young Roma students are carving out a role for themselves in society, and I am a part of that new generation." "Although I often have to prove myself to non-Roma, I have confidence in my background and culture. Being Roma has given me the advantage of knowing a second language-Romanes. My bilingualism will allow me to connect with a larger media audience. I am very young, twenty-one years old. I am willing to put in the effort and time to make my dreams a reality." Radostina Chaprazova is currently Country Director of the Areté Youth Foundation in Bulgaria. She was raised in the small town of Samokov, near Sofia by her mother, a geography teacher. "At the time my mother was the only teacher of Roma origin in the region. I never knew my father. My mother gave me everything I needed. She put my concerns ahead of her own and pushed me to seek the best possible education." Radostina is married to a former cameraman with NOVA TV, one of the few Roma cameramen in Bulgaria, and has two children, a girl of thirteen and a boy of seven. Radostina credits her mother's guidance in ensuring her smooth trajectory along the path of post-secondary education. "My mother started her own NGO and began a school integration project in our small town. Many of her former students completed university so she was well aware of the hurdles facing students from minority groups such as the Roma and Bulgarian Muslims." At her mother's insistence, Radostina took a ten-month English language course designed for second language speakers of Bulgarian at American University in Blagoevgrad. With this targeted instruction, Radostina was able to pass the TOEFL. She was then granted a scholarship to study international relations and political science with a minor in journalism. "Without a scholarship, I could not have afforded to attend American University. I was only the second Roma to have studied there. " Radostina completed her degree in 2003. "During my time at American University, we hosted Peace Corps Volunteers from Washington, DC in the United States. They motivated me to confront challenges; they were my professional mentors and role models." Radostina needs only to complete a master's thesis, in order to obtain her MA in public policy and management at Sofia University. Radostina has devoted more than fifteen years to moving civil society in Bulgaria toward more inclusive policies and less discriminatory actions against Roma and other minorities. She has worked for several NGOs including a term as OSI program coordinator of an REF project to increase the number of Roma students entering the medical field. Radostina was one of the first Roma Bulgarian interns at the EU Commission in 2005. Her focus was employment and anti-discrimination initiatives. She was also an expert with the Bulgarian Ministry of Economy and Energy. Since 2013, Radostina has been Bulgarian country director for the Areté Youth Foundation in Sofia. Prior to her current position, Radostina was a Roma integration expert for Areté. "What drives me is my understanding that Roma youth have a lot of potential, but do not have opportunities to demonstrate their abilities. I know this from my own experience. No matter how tough the job, I have a chance every day to see the outcome of our programmes. I know the personal stories of these young people and am overwhelmed by their courage in the face of such challenges. When young people return to visit us once they have graduated, and are in meaningful careers, we realize the importance of the Areté programmes, such as Zaedno Napred and the Roma Professional Network, in shaping a brighter future for the Roma of Bulgaria." Yoana Kirilova Decheva is the OSI project coordinator for Roma directed programmes in Bulgaria. One of her key tasks is to manage the Roma Health Scholarship, targeted funding available to Roma students entering the medical field. 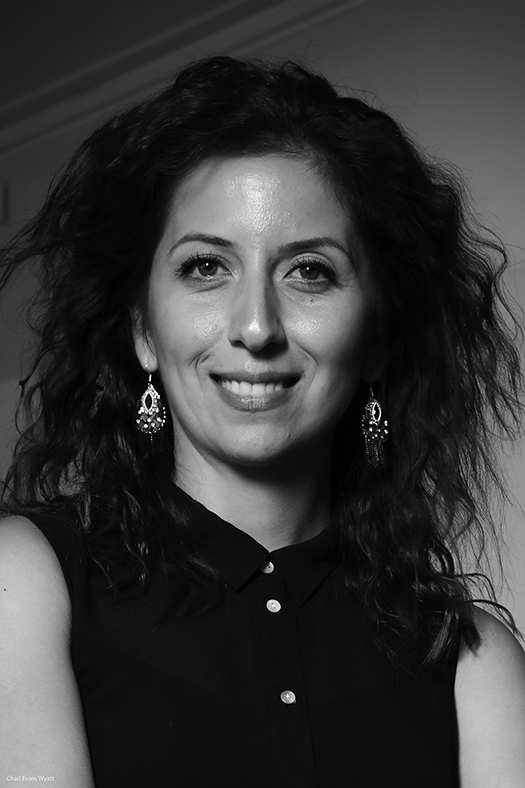 Yoana has a BA in Political Science from Sofia University and a MA in Project Management. "I never thought I would end up working with OSI. It is a coincidence that my MA was direct preparation for my current job." Yoana participated in an internship at the OSI Sofia office. When the internship ended, Yoana applied for this position and was hired because of the relevant MA and on the job experience. Only 25 years old, Yoana relates that her family always expected her to do something with her life. "There was no option; it was the expectation of my parents and grandparents. My mother and grandmother are both teachers." Her family made it possible for Yoana and her sister to attend integrated schools in Sliven. At present, Yoana's younger sister is studying medicine in Varna. To this point, Yoana views her MA thesis as her greatest accomplishment. She received high acclaim for her thesis which examined reasons for early school leaving in Bulgaria. Yoana found that dropout rates could be lowered through effective measures employed by NGOs and tied to EU project outcomes. However such successful endeavors are all sustained through project funding; none are sustained by school system policy in Bulgarian schools. New public school legislation aimed at school desegregation came into effect one year ago, but has not been implemented because a new federal government came into power. Current attempts at school desegregation are failing because in many communities the entire pop is Roma. When Roma children become the majority, Bulgarian parents take their children out of the school. Yoana's research indicated that school consolidation is also closely related to school leaving because Roma communities do not send girls to school after puberty if the schools are located far from the villages. Yoana then recounted a sad occurrence. Recent refugees to Bulgaria fleeing violence in Syria are being treated like Roma. Bulgarians do not want their children going to school with refugee children claiming that they are "dirty" and may carry diseases. Yoana hopes to attain a Ph.D. in the field of economics and to build a life in Bulgaria. Daniela Dimitrova was born and raised in the town of Dolna Banya in Southwestern Bulgaria. Her parents, brother and sister still live in the area. Dessy and her husband now live in Sofia. In fourth grade, Dessy was moved from a Roma only classroom to an integrated class. At first it was difficult keeping up with students who spoke Bulgarian as their home language, but within a year Daniela was earning the highest marks at her grade level. After graduation, she attended South West University in Blagoevgrad, completing a BA in international relations and an MA in primary school education. Initially her parents hadn't wanted Daniela to attend university. They were afraid she would lose contact with her Roma culture and language. But Dessy has thrived. She speaks traditional Romanes as well as Bulgarian and English. Dessy is a second year Teach for Bulgaria instructor at a Sofia primary school. "I have wanted to be a teacher since I was a little girl and saw students bring flowers to their teachers at the beginning of each school year." Although her BA degree is in international relations, Dessy views teaching as "the aspect of international relations, which engages your heart as well as your brain." She has followed her students from third to fourth grade and celebrates this opportunity to provide continuity especially for Roma students in the primary grades. "I accepted this opportunity for a portrait and interview to show my students what is possible." 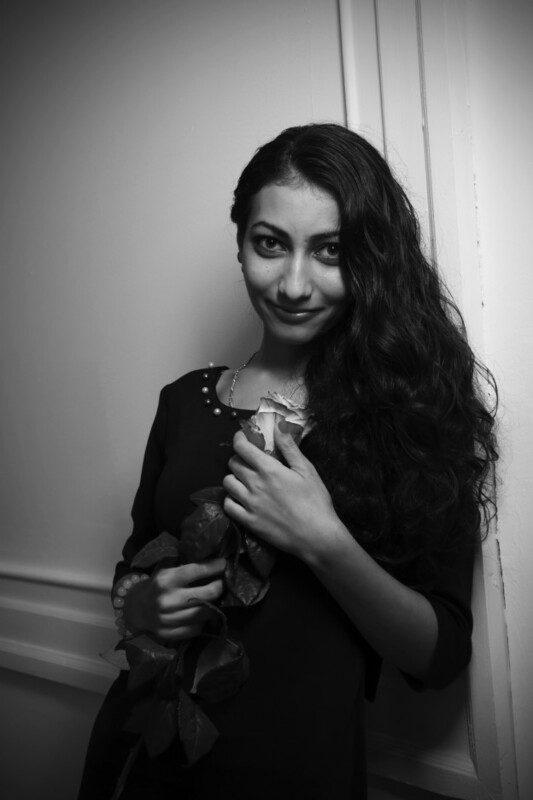 Dessy is also a member of the US Ambassador's Youth Council, and with others, is charged with decisions involving integration of minority populations including the Roma and funding arts, culture and education projects. Dessy is convinced that through teaching she can pay it forward with her students, "I will teach you and you will teach the next generation. This is how Bulgaria becomes more inclusive." Last year Dessy and her then third graders put on a financial literacy workshop for adults as part of the Teach for Bulgaria conference. The video may be viewed on www.teachforall.org. Dessy challenges her students to examine their methods of inquiry and study techniques. Last year's students created a folio, detailing problem solving techniques. Some students had difficulty articulating their thoughts so others helped them with the writing process. Sadly, Teach for Bulgaria only funds teachers for two years. At the end of this school year, Dessy must either transfer to the Bulgarian national educational system, or switch careers. If she remains in teaching, she will experience a significant pay cut. As Dessy says, "when the time comes I'll decide. My students teach me." We met Aneliya Dudinova at the Anna Café in Lesnovo, Sofia Province, Bulgaria on a sparkling fall afternoon. 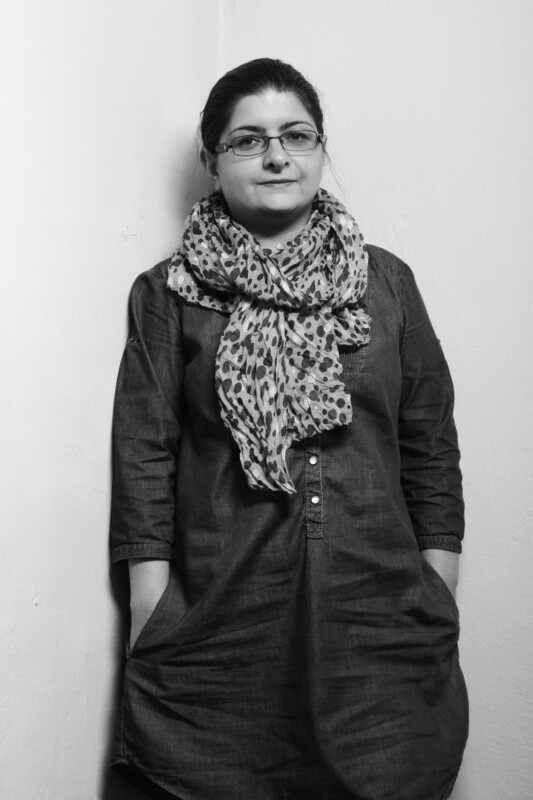 Aneliya's family comes from Lesnovo, "all the way back to my great grandparents generation." Anna's daughter, Anna Cristina is the only Roma student in the seventh grade at the Gorna Malina secondary school. Anna has ensured that her daughter has had the opportunity to attend integrated schools because she wants her to have a competitive education, which will prepare her for university. Since Anna separated from her husband, she has had to sacrifice to provide extra classes such as gym for her daughter. She has also paid for a taxi to transport Anna Cristina safely to and from school each day. Anna's parents, who both attended secondary school, completely support her efforts and help financially as much as possible. Anna Cristina would like to pursue a master's degree eventually and the entire family has agreed to support her goals in whichever field she selects. 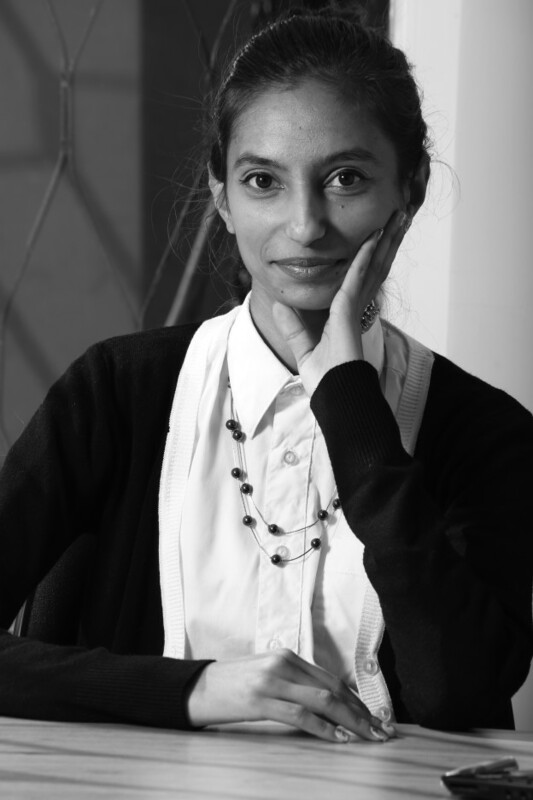 Aneliya has an MA in graphic and visual arts. However, her first job was as a kindergarten teacher. She then worked for more than fifteen years as a web designer for NEED.bg, a major commercial enterprise based in Sofia, which distributes a wide range of products to retailers all over Bulgaria. In 2014, Aneliya returned home to Lesnovo, to focus her energy on improving opportunities for Roma there and to open her own small restaurant. Aneliya's brother and sister in law ran a convenience shop out of what is now the Anna Café. They allowed customers to run up credit accounts and the shop was unable to turn a profit. When her brother moved to Italy, the space became vacant. Aneliya applied through a Bulgarian small business grant to restart the shop, but her application was denied. Instead, she had to use money she had saved through her stock options with NEED.bg to open the Anna Café. Aneliya's vision was to create a place for young Roma to gather and talk, particularly about their plans and obstacles. 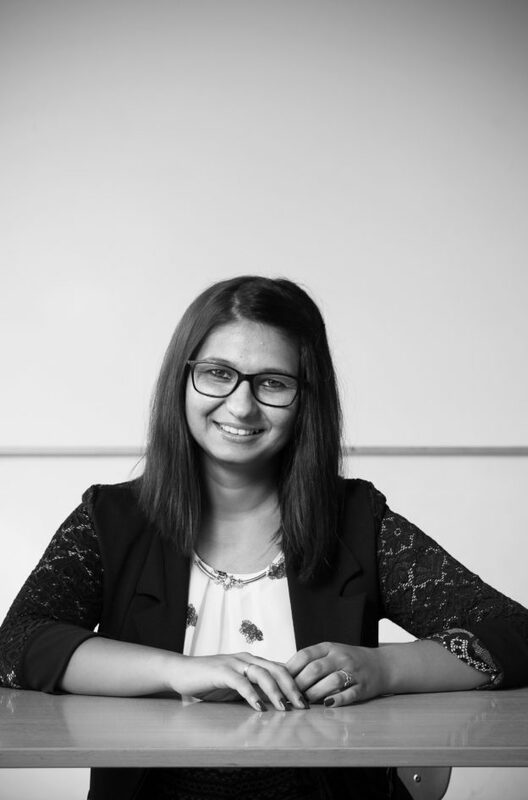 Aneliya's first employee was a young woman of Roma origin, but within a few months she too moved to Western Europe. Teachers from the segregated Lesnovo primary school arrived at the café during our interview with Aneliya, to prepare their case for secondary school integration. The principal in Lesnovo does not want to integrate the local secondary school, but is also resistant to sending Roma students to secondary school in Gorna Malina fearing that the Lesnovo primary school will lose pupils and thus be slated for closure. Amalipe has arranged a visit by the Swiss Ambassador to the secondary campus. Through the auspices of Thirst for Social Alternatives, as part of the America for Bulgaria Organization, Roma students will receive scholarships to defer all fees and the cost of school supplies required at the secondary level. 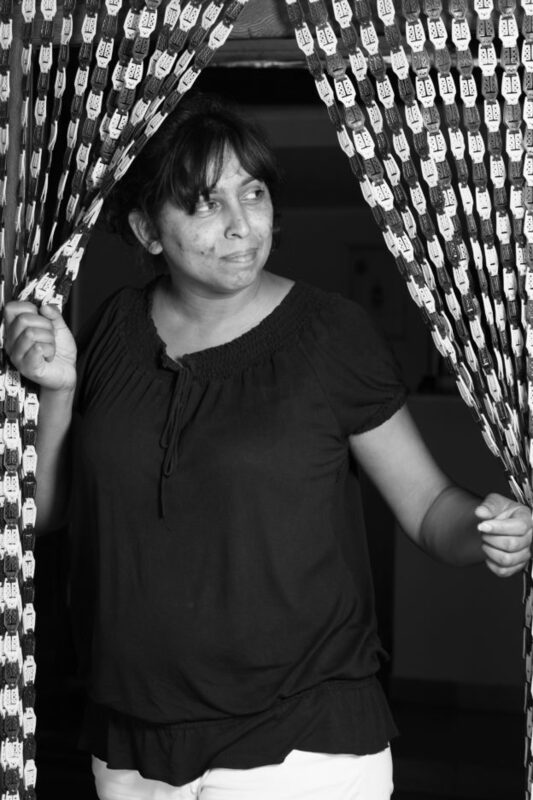 Aneliya's long-term goals are to build business opportunities for Roma throughout the area. She has applied through a government grant to hire two Roma employees to help manage the restaurant and handle the accounts. "It is crucial for the future wellbeing of the Roma community that both father and mother are employed and can support their children. The most important initiative is creation and expansion of Roma entrepreneurship." Pietr Petrov Ivanov is a traditional craftsman who lives in the town of Montana. He makes tack for horses, and is one of the last in Montana to practice this highly skilled occupation. Pietr and his wife, Jana, have two sons and a daughter. All three children are now living in Germany because they were unable to find employment in Bulgaria. "I learned how to work with leather by helping my Dad. He was a shoemaker. After I finished my military service, I decided to learn how to make saddles, harnesses, bridles- all the various forms of tack for both riding and driving horses. I went to the summer and fall agricultural exhibitions in Plovdiv, the second largest city in Bulgaria. I saw a saddle there that I liked and decided to try my hand at making one. I received a five year contract for saddlery. When I returned to Montana, I made a racing saddle, a military saddle and a Western saddle. I also repaired a circus saddle used for trick riding." Pietr has made bridles with standing and running martingales as well as single and double reins, and all manner of harness for wagons and buggies. "That was my greatest accomplishment making those saddles from scratch. Also the most interesting task I have ever set my mind to." Pietr is now seventy-eight years old. He taught his children the craft of tack making but now all three have gone abroad to find work. "At least I know they will never go hungry because they know how to work with their hands." Miglena Georgieva Jordanova works with the Bulgarian NGO, Areté Youth Foundation, as manager of the "Forward Together" summer camp program. The summer camp initiative motivates Roma youth to continue their education at the university level. "I work with young people because they are our future and we must invest in them." Summer camp students come from all over Bulgaria. They are recruited through cooperation with municipalities, organizations, NGOs, as well as through the Areté Youth website and Facebook page. Areté Youth Foundation has specific criteria for choosing candidates for its summer camps. All students must be Roma, between the ages of sixteen and twenty-one with high GPAs. All students write an essay as part of their application. There are two options: "Why is education important for me?" Or "How do I see myself in 5 years?" "My experience working on Roma issues began in my home town of Dupnitsa where I focused on integration of Roma in public schools. My siblings and I attended integrated schools because our village is too small to have a Roma neighborhood." Miglena obtained a BBA in Business Management and an MA in International Marketing. "My greatest achievement so far has been raising the self-esteem of the many young people who come to me looking for ideas on where to go and what to do to further their education. Young people themselves are the ones who inspire me to do this work." Through her job at Areté Youth Foundation, Miglena acts as a role model for Roma youth on a daily basis. She hopes to continue her education. "The higher my own skills, the more I will be able to give back." Her plan is to be working with the Areté Youth Foundation five years from now. "When you have a job you love, you put your heart and soul into it." Albena Kisyova is a Senior Expert in the fields of education, sports, youth and integration for the municipality of Vratsa in north central Bulgaria. Albena was born in Vidin, her mother's hometown, but attended school in Vratsa, her father's native city. She is married with two sons, the elder in his second year of university and the younger completing secondary school in Vratsa. Albena's two sisters both live and work in Bulgaria. "My father was my greatest influence as a child; he motivated me to become a well-educated Roma woman. He often told me, 'only through education can we prove that we Roma are the equal of any other ethnic group.'" Attending integrated schools was an important motivator. There was no bilingual education offered, but that was not a problem for Albena as she is a native speaker of Bulgarian. Albena graduated from secondary school in Vratsa. She obtained a BA in preschool education from St. Cyril and St. Methodius University in Veliko Tarnovo and then completed an MA in management and educational administration. "My career in Vratsa? The career chose me. When the regional administrator left the country, the post was vacated. I applied and was chosen from a group of twenty-two applicants." Albena is involved in projects sponsored by several NGOs - Amalipe, Areté Youth Foundation etc. She has been in the job now for nine years and has earned the respect of the residents of Vratsa, both Roma and non-Roma. "My greatest accomplishment is acting as a role model for Roma students in our region, giving them confidence in their ability to complete secondary and post-secondary education and to maintain a successful career in Bulgaria." Sasho Kovachev is a director with the Bulgarian NGO, LARGO under the auspices of the U.S. non-profit, The Trust for Social Achievement (www.socialachievement.org). Sasho has spearheaded several LARGO projects in Kyustendil designed to increase the Roma community's access to quality health care services. Sasho was born in Kyustendil and raised in the Roma Mahala. His mother, father and one brother still live in the neighbourhood. He attended a segregated Roma school up to grade six. After that he changed schools and was placed in multi-ethnic classes. "When I first attended school with non-Roma students it was difficult to adapt to another culture and make new friends." Sasho completed secondary school in Kyustendil then obtained a BA in pedagogy from St. Cyril and St. Methodius University in Veliko Tarnovo. In 2013, he completed his master's degree in social work from South West University in Blagoevgrad. Sasho is married with one son who is learning English at American University in Blagoevgrad before beginning his post-secondary studies. Concern for the wellbeing of the Roma community is the impulse that motivates Sasho in his career choices. The LARGO priorities, access to health care, quality schooling, and increased Roma entrepreneurship mesh well with Sasho's personal goals. Additionally, as a regional coordinator for the U.S. non-profit, the Areté Youth Foundation, Sasho mentors Roma high school and university students and networks with other Roma professionals throughout Bulgaria. 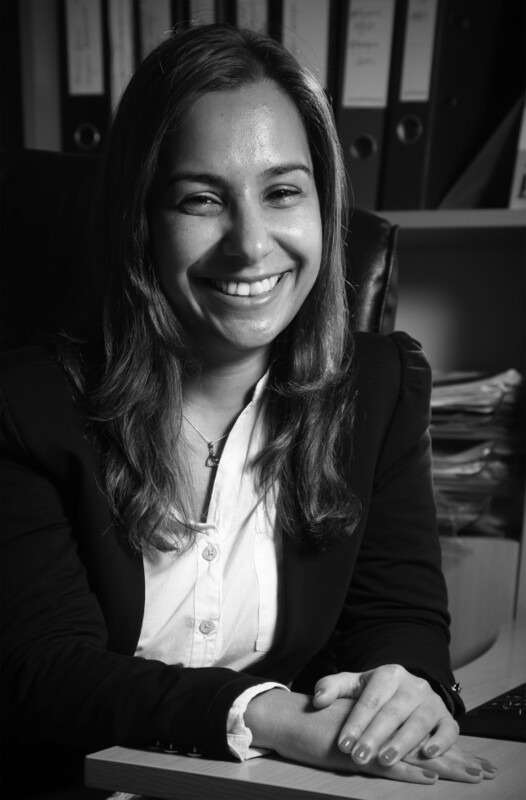 "Nothing can replace practical experience when it comes to achieving long term outcomes for the Roma community." LARGO health care service providers go door to door in the Roma neighbourhood. There is no general public health insurance in Bulgaria. Pregnant women without prior work experience are not eligible for insurance. LARGO is now funding health insurance for thirty pregnant Roma women. LARGO also offers free check-ups for women without insurance. An informational campaign with neighbourhood based workshops, educates families about developmental milestones expected from birth to age three. Another LARGO initiative is screening for tuberculosis and free hospitalization if necessary. In the educational realm, LARGO trains Roma mediators to work both in the community with families and in schools, building relationships between educators and Roma students. "Educators must first believe in the capacity of Roma students to succeed and in fact to excel." The Areté Youth Leadership Camps strengthen the resolve of Roma youth to overcome challenges while giving them opportunities to interact with like-minded Roma from all over Bulgaria. "In the next fifteen years I would like to see a complete makeover of the Roma neighbourhood in Kyustendil - more educated, healthy residents and a thriving business sector." Ivo Koychev is pastor of the Love Bridge House in Stara Zagora, Bulgaria. The church is part of the global evangelical mission of the Life in Glory Apostolic Centre and partners with the Four Corners Ministries founded by New Zealanders, Kevin and Denise Reid. The Four Corners Ministries mission statement reads in part: "... to preach where Christ is not named. To enable effective evangelism through a mature church...and (to advance) the Kingdom of Heaven throughout the region." Ivo and his wife, Ganka, live in Stara Zagora with his parents. His elder son and family also live in Stara Zagora while his younger boy and his family live and minister in Texas. All the family is involved in missionary work to some extent. "I speak in poetry because I am inspired by God. This is my calling. My inspiration. To truly serve God one must put away many temptations of this material world. I had encounters with God throughout my childhood and youth, but I did not accept the Lord as my Saviour until 1991. I was only twenty-four years old at the time. Five years later I became a pastor; I knew from the beginning that I must obey the call from God. Since I was born and raised in Stara Zagora, I knew my church must be built here in the Roma Mahala neighbourhood." The communist regime lost power in 1989, but in Ivo's opinion communist ways of thinking are still common in Bulgaria. He views the Love Bridge House as part of an effort to replace communism with a practical Christian approach. "This is not a ritualistic church. Our objective is to help Roma integrate into all aspects of Bulgarian society. We instruct children in foundational Christian values, but we also provide clothes and supplies as needed so that children can attend school." From 2000 until 2015, sponsors provided a variety of funds, most importantly to construct the Love Bridge House. Most sponsors came from Germany and Scandinavia. 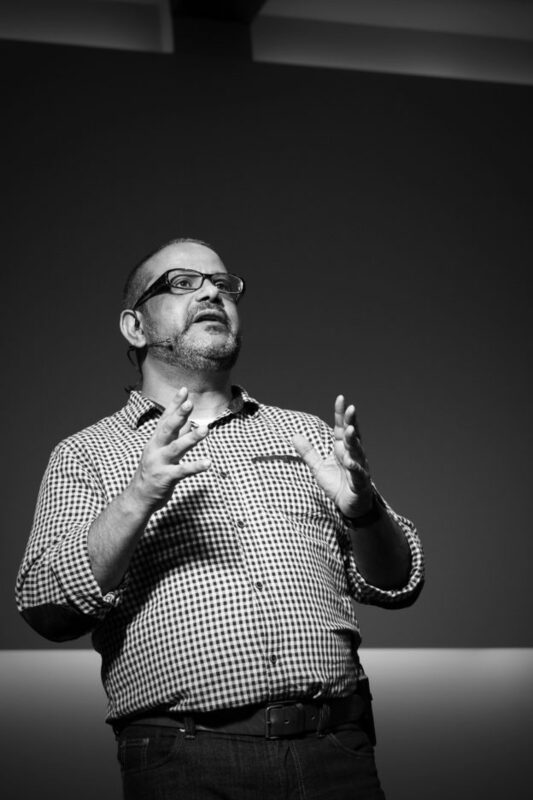 "From my perspective", Ivo says, "the church is a supernatural phenomenon." In the 1990s, Ivo worked with about fifty Roma children in a small room. Building the multilevel church took two years with much of the labour provided by the German sponsors. Now there are adjacent classrooms and a playground with space for about one hundred and fifty students. Krasimir Ivanov Krasimirov is in charge of Public Relations and Media Contact for the Bulgarian Parliament in Sofia. This is his fourth year in that role. He is from the town of Lom where his family still lives. At only twenty-nine years of age, Krasimir holds a BA in Philosophy, an MA in Political Science and is a Ph.D. candidate in Political Rhetoric at Sofia University. Krasimir will be the first Bulgarian Ph.D. in this discipline. As part of his political science studies, Krasimir participated in a parliamentary internship for Roma youth funded by OSI Sofia. There were eleven interns, but Krasimir was most motivated. He immediately applied for this position and was hired after the third application process. "My inspiration to develop my career comes from my parents. I saw how my parents set aside money for my education. The best way to thank my parents is by finishing my Ph.D. My professors at university have also inspired me with their academic excellence. I am giving back to my community by mentoring Roma political science students at Sofia University and giving them the benefits of my experience. I also conduct workshops for Roma secondary students. In the past year, at least fifteen Roma young people have entered university after attending my training and sharing their experience through Facebook." Maestro Lambov has recently returned from a presentation of his ballet Nunka in Moscow. When we spoke to him, he was on his way to Plovdiv to conduct a performance during the fall music festival. "I don't have time to dream about the future; I'm busy living it." 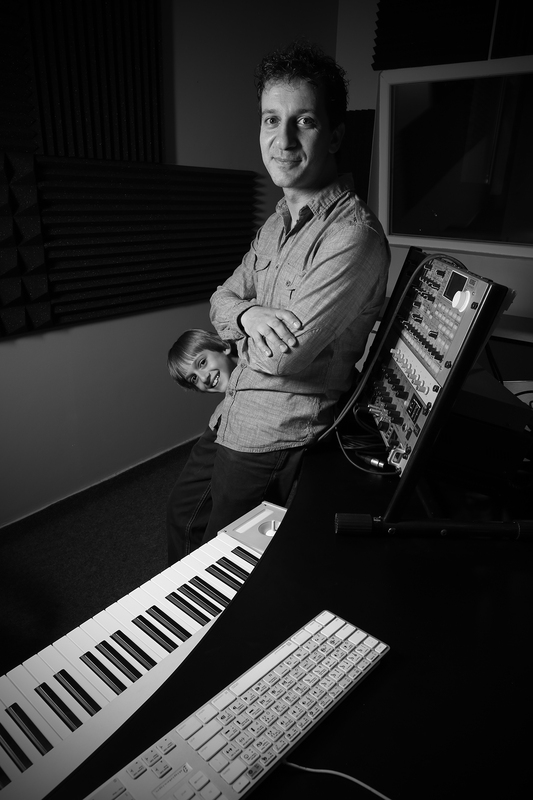 Minko Kirilov Lambov is the seventh generation of musicians in the Lambov family. He is the composer of a ballet-"Storm" and a pop Opera "The Fisherman and his Soul" (based on a story by Oscar Wilde with libretto by Ana Topalova) which premieres on Orthodox Easter Day 2015. Other of Minko's compositions for keyboard derive from his Roma musical heritage, seasoned with jazz infusions. Minko's parents, Kiril and Rusalina started teaching him to play piano at age two, but at first he resisted. Then in grade eight, his teacher encouraged him to return to the piano. Minko applied to the National Academy of Music and won the young musical talent scholarship with his father's composition-a sonata. He studied in both the department of composition and of conducting. "Like my parents, I've always been a musician." 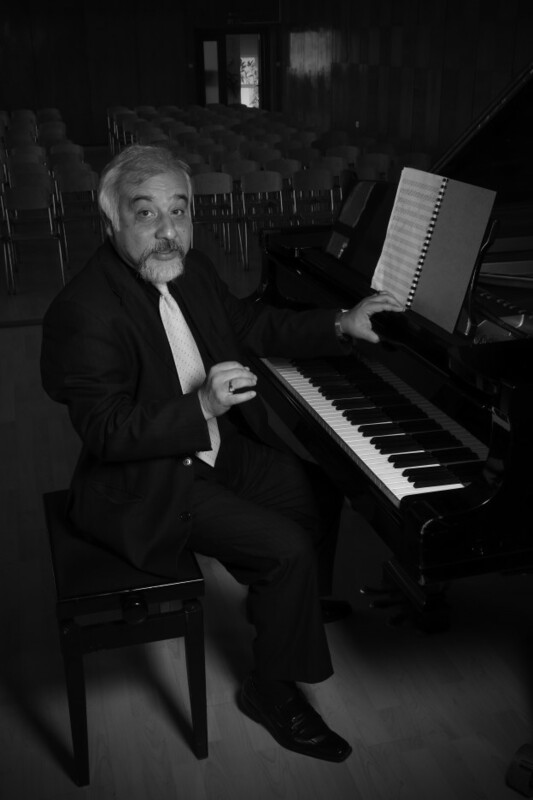 Minko performs with his orchestra Point of View and tours throughout the Balkans and Turkey. Performances may be viewed and Minko's compositions such as Ikadem and One Week may be purchased online. Minko dreams of finding an agent who will promote his orchestra worldwide and the funds needed to grow his studio in Sofia. His son, Kiril (Kiki) age 9, is learning guitar. Although Minko is already a well-known musician and composer in Bulgaria, he never forgets what his father told him, "You must be ten times better than everyone else in order to succeed when you are Roma." The craft of ironmongery or the manufacture of iron goods is an ancient one, dating back to at least 1000BC and the beginning of trade in metals. 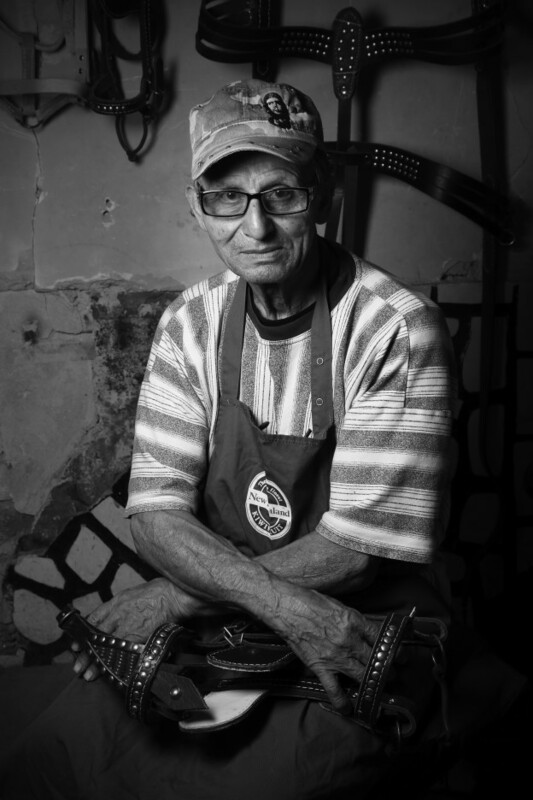 Dancho Danchev Marinov is the last traditional ironmonger in the town of Montana. He creates iron links, chains and other objects by hand. He learned the craft from his father-in-law and began working with him to create chains and locks for paddocks and gates when he got married thirty-five years ago. After completing secondary school, Dancho worked as a mechanic for fifteen years and then as a smelter in a steel mill. He always kept up his skills in iron work and employed them to good use when he built his own three storey house. Dancho was born in the town of Dobrolevo and still has a home there with land and an orchard. He is the only one of his family living in Montana at the moment. His wife is in Italy caring for elderly people. His eldest son, Roberto, is in Sofia with the Ministry of Labor and Social Services and his younger son is in Holland working on ship maintenance and repair. "My dream is to return to Dobrolevo and bring my family back together again. I have four grandchildren and my wish is for them to finish secondary school and then go on to college. I would like them to be able to study here in Bulgaria, but would they be able to find a job and stay here? I'm not sure." Emil's passion is dance, specifically salsa. Emil was introduced to salsa dancing at the Havana Club in Bratislava, Slovakia in 2007. He was entranced by the intricate dance movements and sought out a teacher in Sofia when he returned to Bulgaria. Emil encountered a Cuban dance instructor who became his mentor. Over the past five years he has taken part in salsa competitions and performances throughout Bulgaria. "The salsa environment is very accepting of people from diverse backgrounds. If you have talent, you belong." Although only in his early 30s, Emil has decided to move from being a dancer to creating images of dance. "I no longer want to be in the spotlight; I want my photographs to dance for me." Ivan Miglenov is a programme manager for the Areté Youth Foundation in Sofia. He was born in Vratsa in north central Bulgaria where his mother still lives. His younger sister is studying social education, sometimes referred to as community education, at St. Cyril and St. Methodius in Veliko Tarnovo. "My first role model was my aunt who is a teacher in Vratsa. She encouraged me to go to university and to major in education." Ivan obtained his BA and MA in the related field of social work from South West University, Blagoevgrad. He then studied elementary education at university in Plovdiv and taught primary grades in Sofia for two years with the NGO Teach for Bulgaria, a campus of the U.S. based Teach for All non-profit (www.teachforall.org). The majority of students in the school where I taught are Bulgarian. I was working in a project designed by the European Commission to promote Roma inclusion in public schools. "Students told me I was the first Roma teacher they had met who was teaching in a 'Bulgarian' school." Ivan began working as a programme manager with the Areté Youth Foundation in 2016. He is in charge of the Zaedno Napred (Forward Together) leadership camp programmes. "I am contributing to an organization, which is committed to opening opportunities for Roma youth. I feel that I am giving back to my community every day when I arrive at the Areté offices." Eventually Ivan would like to obtain a Ph.D in education and teach at a university level. "For the time being, I would like to hone my skills as an educator and organizer through my position at the Areté Youth Foundation." Miglena Mihailova was born in a village near Blagoevgrad and attended integrated classes at the village primary school. Her mother still lives in the village, but sadly Miglena lost her father to cancer eight years ago. Both her younger brothers live and work in Bulgaria. Miglena, her husband, Nicolai and son David live in Blagoevgrad where Miglena practices law. "My father and I would always read together in the evening when he returned from work. He encouraged me to pursue post secondary education. Generally, in Roma families, boys are the ones encouraged to continue their education, but Miglena's father had a different viewpoint. He would tell me, 'a woman truly needs more education because men can always find a way, but a woman without education is often exploited.' "
When Miglena received her graduation certificate at the end of primary school, she at first didn't realize that it was hers. She was unaware that the Bulgarian government had changed her Muslim Turkish name, Madiha (praiseworthy), to a Christian name, Miglena. Miglena attended secondary school at a nearby high school. She then applied to the South West University Neofit Rilski campus in Blagoevgrad so that she could return home each night. Law was always Miglena's first choice for a course of study. 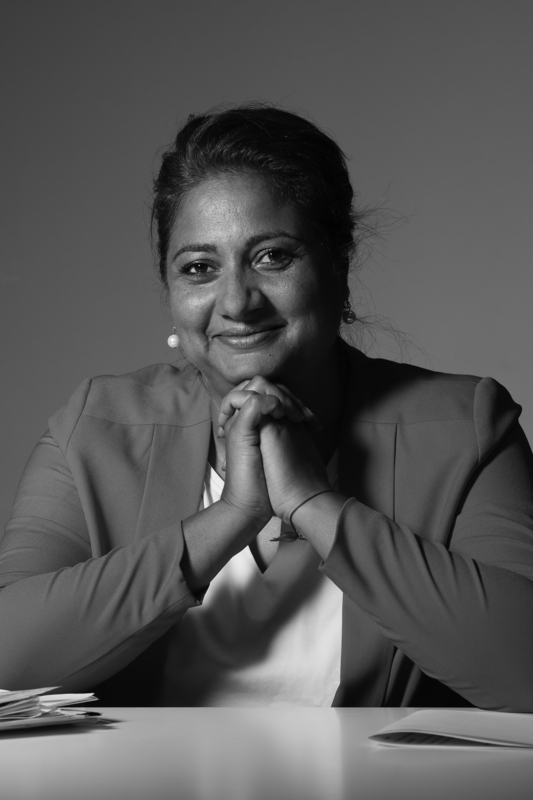 Her motivation was a desire to change the discrimination and prejudice, which she herself had experienced because of her skin colour and ethnic background. Undergraduate courses explored Roman Law, then Bulgarian law, and at a master's level international legal policies and civil law. After graduation in 1997, Miglena completed a practicum in a local prosecutor's office. She then sat and passed the legal exam requirements to be a lawyer in Bulgaria. "I am particularly proud that I accomplished all this on my own and with the help of my family. I was not supported by any NGO or government funds." Miglena now has sixteen years of legal experience. The majority of her cases have been criminal investigations of child abuse. Miglena is the first lawyer in the Blagoevgrad area to use a one-way mirror room to collect oral testimony from children regarding abuse. In 2005, Miglena was awarded the Gender Project Bulgaria prize as one of the most successful women lawyers in the nation. Miglena is also an executive director with the Bulgarian NGO, LIDER: People, Ideas and Action for Effective Solutions. 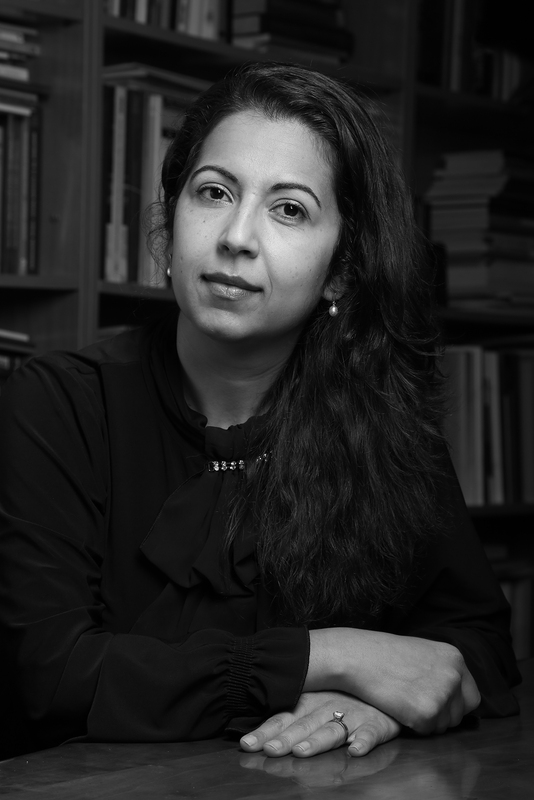 Another major focus of her work has been housing policy affecting Roma neighbourhoods. Many Roma do not have deeds showing legal ownership of their dwellings. At times, the land is not registered by the municipality. In those cases, Miglena registers just the dwelling. Taxes can then be paid and the situation regularized. "Once again, anti-Roma sentiment has complicated the process. After five months, the mayor of Blagoevgrad had legalized dwellings outside the Roma neighbourhood, but no applications from within the 'mahala' were approved." "My goals now are to transfer my knowledge to the next generation. I would like to become a university professor and perhaps write a book. Most importantly, I want my son to understand his culture and be proud of his background." Tzanko Todorov Mihajlov is the eldest child of a well-educated Roma family in Sofia. His father was a pediatrician; his mother works as a nurse's aide. His younger brother is an IT Engineer with Hewlett Packard. Tzanko obtained an MA from the New Bulgarian University in Business Administration. 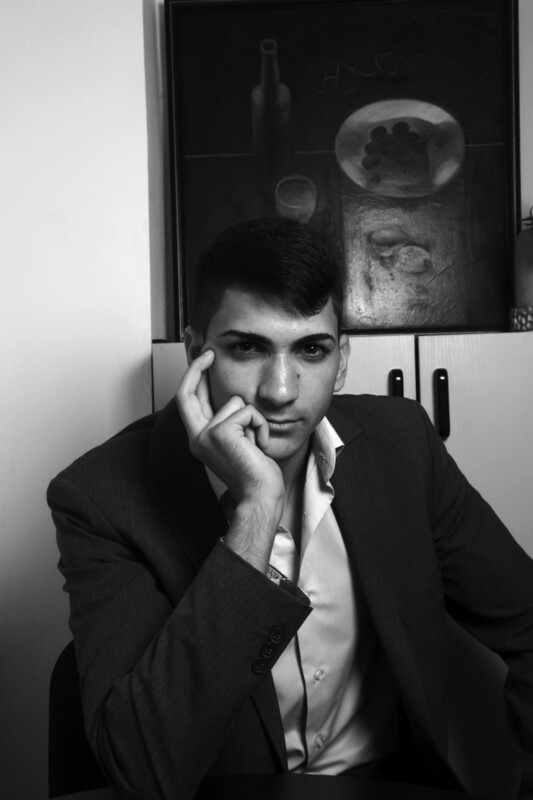 He is currently working on a second MA in Innovation, Entrepreneurship and Finance at a private university in Sofia. Tzanko has been a project coordinator with OSI Bulgaria for the past five years. Since Bulgaria is now part of the EU, all grant proposals and requests for EU structural funds, must follow EU format specifications and meet common standards. Central to Tzango's position at OSI is provision of assistance to Roma NGOs, business start-ups, and school systems to complete the application process and strategize allocation of funds. The website www.pgf.osi.bg outlines project objectives and features video examples of successful enterprises such as the Roma beekeeping entrepreneurship in northwestern Bulgaria. "My inspiration has always been my father. He was a pediatrician, however because of the color of his skin, he was restricted to practicing medicine in a Roma neighborhood-Hristo Botev-in Sofia. He worked 24 hours a day because he could not refuse patients who came to his door after hours even if they did not have money for drugs or medical insurance. 'This situation is not the fault of the children', my father would say. "My father was his own Roma NGO." "I have had the opportunity to set high standards for myself and to begin to reach my career goals. To get ahead as a Roma is difficult. More than anything, I now want to establish my own family and do my best for the sake of my future children." 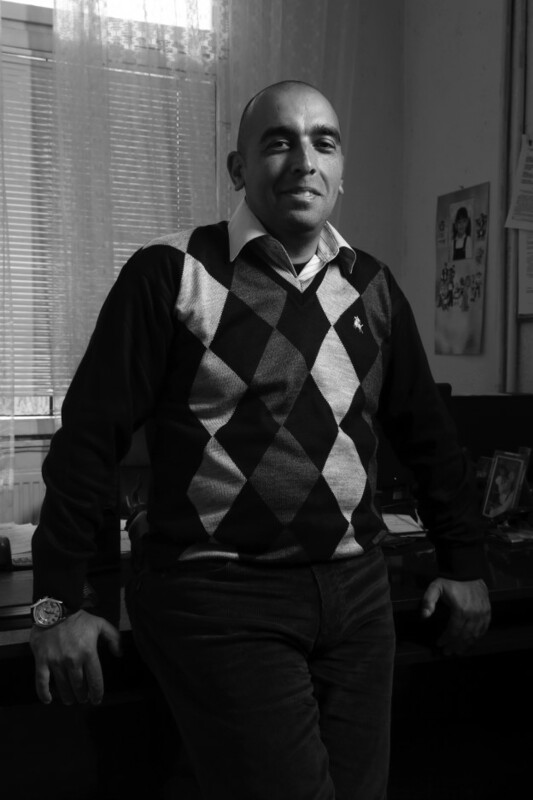 Milen Milanov oversees the Roma Education Fund's Roma Versitas programme in Bulgaria. Milen, his wife, and small daughter live in Sofia. His wife is of Turkish background and her name, Vizhdan, is derived from the Turkish word for conscience or integrity. Milen was born in Sofia, but raised in Staliyska Mahala, a village near the town of Lom. Many family members still live there including one brother who owns a local business. After the dissolution of the communist government apparatus in the early 1990s, the first Western NGOs made an appearance in Bulgaria. Manush Romanov, began petitioning for human rights for Roma. Revelations of targeted police violence against Roma appeared for the first time in national media. In 1999, Milen began studying English at American University. There he encountered others grappling with Roma issues. 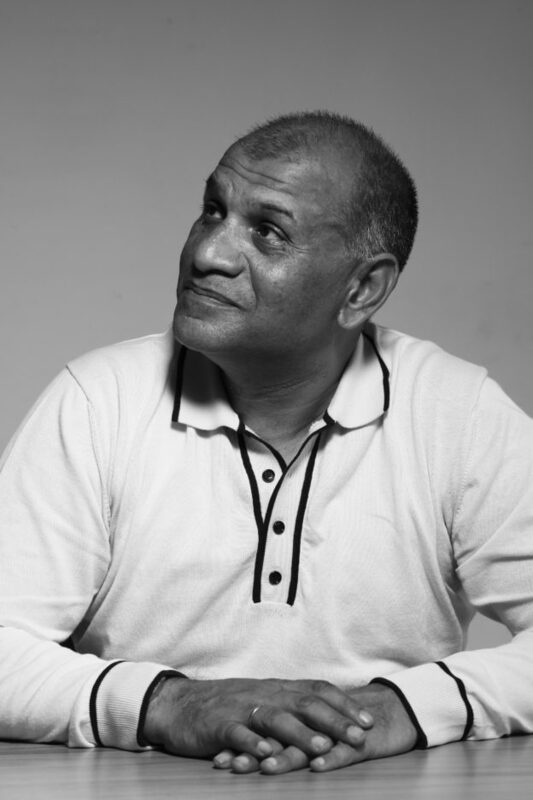 His first job was as a teacher in a primary school; he then joined the Romani Baht Foundation. That was the change point for Milen. Romani Baht brought forward the first educational initiative to push for school integration. Milen obtained a B.A. in business relations and in 2009 was selected as a national coordinator for the European Union's Decade of Roma Inclusion. "Unfortunately, governmental institutions can be inflexible and funds may be allocated according to their policy specifications rather than actual community needs." Among his many accomplishments, Milen references his contributions as deputy mayor of a municipality within greater Sofia as one of the most fulfilling. Milen considers the Roma Versitas programme particularly effective because of its grass roots action model. Roma students can volunteer for Roma Versitas in their final year of high school and become active participants once they enter university. Roma Versitas offers free English language and IT courses, along with mentoring and tutoring opportunities, and a variety of activities designed to better inform students of the particulars of their Roma identity. Roma Versitas initiatives are sometimes funded by participants themselves, using social media crowd funding tools. "On Earth Day, students planted trees in one of the largest parks in Sofia. No members of the traditional media were in attendance. The event was publicized on Facebook." Another fundraised student event provided medicine and supplies to a local crisis center. "Bulgarian media appear singularly uninterested in such positive social initiatives which dispel well-worn stereotypes about the Roma." Milen views the future status of Bulgarian Roma as integral to the long- term stability of the Bulgarian state. He would like to see more Roma graduating from university in all fields of study. He stresses the need for Roma entrepreneurs, educators, lawyers, and scientists. 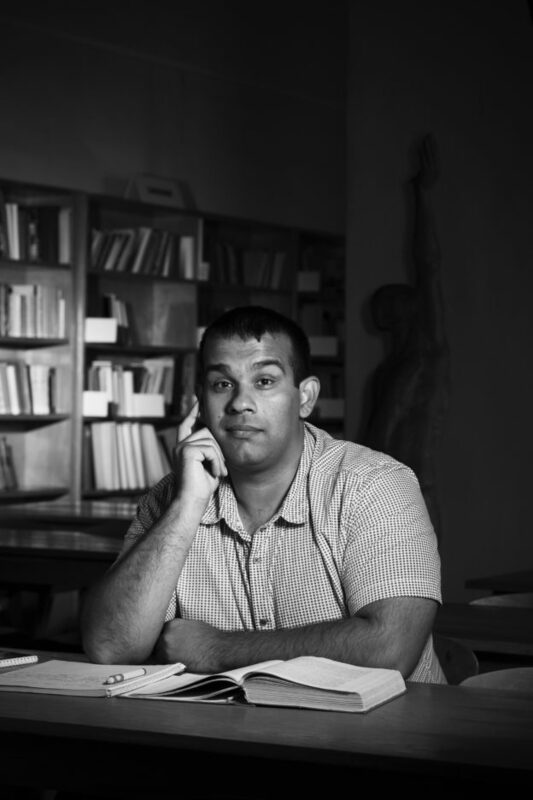 Within the social sciences, Milen cites a lack of Roma sociologists, ethnologists, and political scientists. "Perhaps our community does not realize the key role of political scientists in the integration process." At this juncture, Milen does not see a benefit in Roma students focusing their energies on obtaining positions in NGOs dealing with Roma issues. "OSF has a current project – Barvalipe. The intent of this leadership initiative is to involve Roma university graduates in building governmental policy guidelines throughout Bulgaria. The goal of Barvalipe is to elect Roma politicians to top governmental positions and to establish key Roma representatives at the European Union level." Asen Yordaninov Mitkov acted as assistant, translator, and guide to photographer, Chad Evans Wyatt and his team, throughout the RomaRising Bulgaria project. Asen was born and raised in Vidin, Bulgaria. He is employed as a social worker with the Vidin Family Social Services Agency. He and his wife, Mariana, have two sons: the eldest is attending South West University while the younger has just graduated from secondary school. Asen is now also enrolled at South West University in the area of Social Policy and Education. Asen's main job as a social worker is to identify high risk children- those not attending school, picking through trash, from very poor families etc. He has both Roma and non-Roma children on his case list, but works mainly in Roma neighborhoods. His team provides food, clothing, hygiene assistance, schedules doctor's visits; and gathers health status information. Children up to age 18 receive free health care including dental and vision; Asen refers victims of violence or abuse to a family crisis center. Asen cites his family as his inspiration. "I hope that life in Bulgaria improves in every aspect because I love my country. I want to raise my children here and my grandchildren here." 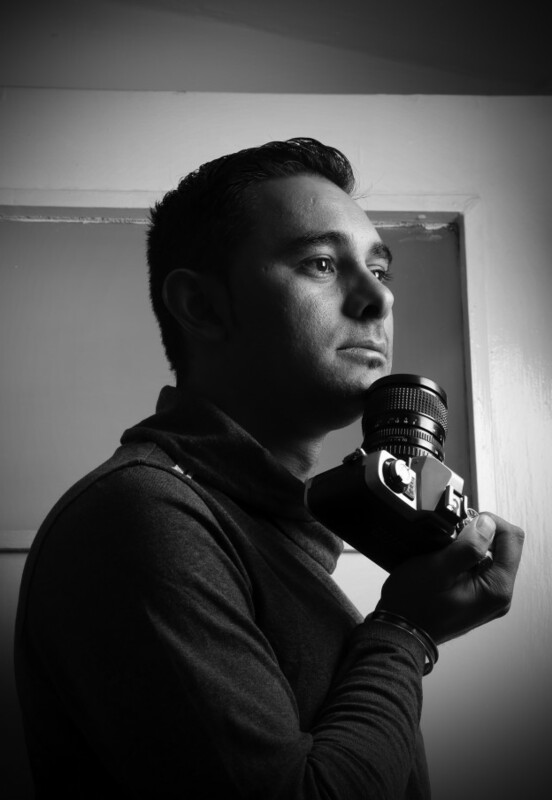 When asked about his experience working with RomaRising BG, Asen responded, "I am grateful to be a part of your team and have the opportunity to learn about photography and practice my English again, to meet outstanding Roma and people from all over the world." "When we had coffee in one of the Roma neighborhoods, I asked the tack maker in Romanes what he would like to drink. A man sitting behind us heard me and said to his friend-'Oh, he speaks Romanes.' I realized that the Roma see me as one of them, but yet also part of an international group." Thank you Asen for being an indispensable part of our team. 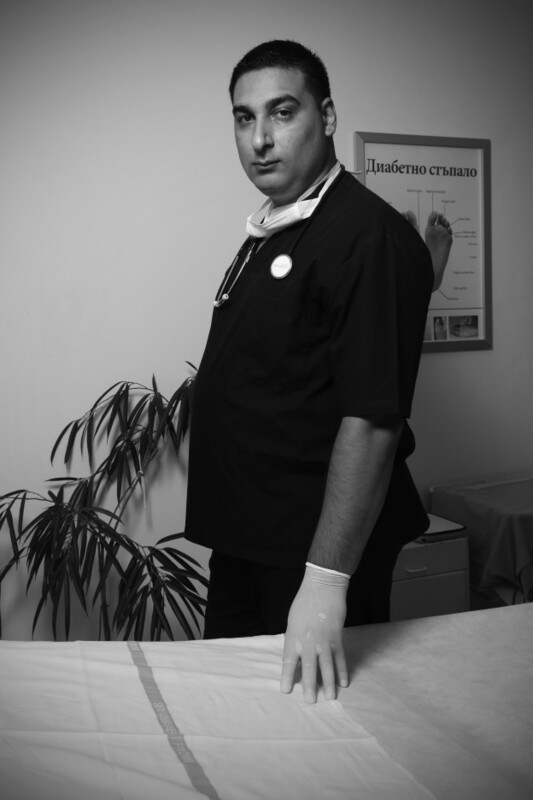 Sybi Valentinov Nikolov is a Physician's Assistant, (also known as a Nurse Practitioner) at the endocrinology clinic in his hometown of Pleven. His father and mother still live in Pleven, but his sister is now in Spain where she owns a store, Los Balkanes. At only age thirty-one, Sybi has already earned B.A. in medicine, an M.A. in Health Care System Management, and is working on a Ph.D. in Occupational Health and Safety. Sybi gives injections, administers IVs and teaches patients with diabetes how to take care of their feet. "Diabetes is a major health concern in the Roma community. I teach proper nutrition. 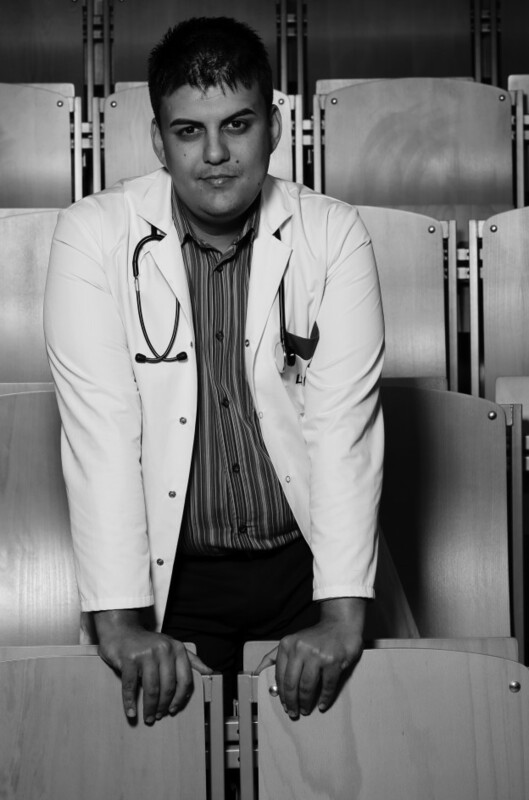 Since I speak Romanes, I am able to communicate with patients in their own language." "My inspiration? My mother. My mother's family lived in a village near Pleven and she walked to school every day-5 km each way. She walked with friends, but one by one her friends got married, and finally my mother was walking alone. She dropped out of school." "It is easy to dream, but to achieve those dreams is very difficult. I will never stop learning. Eventually I hope to become a professor through Sofia Medical University. I have an REF scholarship, but since they are awarded on a year by year basis it is hard to plan far in advance." Bulgaria is famous for its rose oil distilled from the Damask Rose known in Bulgaria as the Kazaniak Rose. Flower shops featuring roses in profusion, along with dozens of other flower varieties; line the stalls of local markets and bazaars. Anelia Atanasova Nikolova, known by her Roma name, 'Anife' is the co-owner with her husband, Angel, of a flower shop in the Montana bazaar. Her brother in law started the business thirty-eight years ago and brought in Anife and her husband. Originally the shop was based in Sofia; they moved to Montana twenty-one years ago. "We arrange flowers for weddings and baptisms. Whatever the client wants, we create." Every week the family travels to Sofia to buy flowers wholesale at the open market. One of Anife's sons and her grandson work in the adjoining flower shop; she has taught them the art of flower arranging and is proud that they are carrying on the family craft. Nonetheless, she is aware that they are only staying in Bulgaria because they cannot find other work. Her daughter is in Italy caring for the elderly. One other son works for a baker in Sofia. Although her grandson graduated from secondary school with high grades, he has been unable to find another job- despite the fact that he speaks fluent English. Sadly, Anife's son and grandson are planning to leave Bulgaria unless they can find a way to build their business in Montana. The opportunities are few in Bulgaria for entrepreneurs. Family is primary to Anife, and she feels the Bulgaria's economic woes as a personal loss. Her dream would be to bring the children home and unite the family again. The Honorable Iosef Yasinov Nunev is a Minister in the Bulgarian Ministry of Education- "my portfolio is minority education: Roma, Turkish, Jewish, Armenian. Minority populations fall into two main groups: traditional immigrants, who have been present in Bulgaria since the Ottoman Empire and new immigrants. New immigrants include Russians, Ukrainians, Chinese, and Arab background children including Syrian refugees." 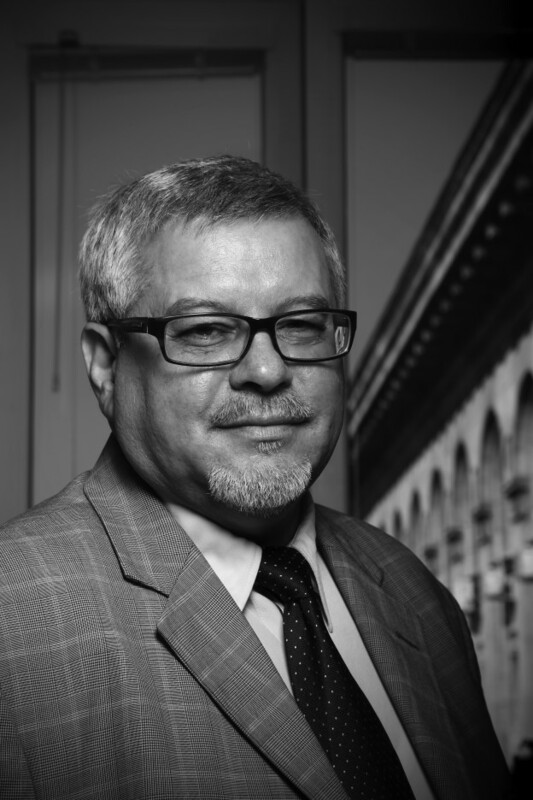 Mr. Nunev's education includes a MA and Ph.D. in education from South West University. He has written a number of books on the issue of the segregation of Roma students in public education and methods of facilitating an integrated school system. His wife is a psychologist. Both his boys have graduated from university. The eldest graduated from Sofia University and is a computer engineer. The younger just graduated from Manchester University in England and is a composer of electronic music. Many Bulgarian schools have large percentages of non-Bulgarian speaking children, however schools only teach in the Bulgarian language. When the teacher knows other languages, the teacher can help to explain concepts to children in their own language. "That is one reason why increasing the percentage of Roma background teachers is crucial to the integration of Roma children in the public schools. Unfortunately because the salary of school teachers is so low, educated Roma do not pick teaching as their choice of career." "My own inspiration was my childhood in a Roma neighborhood. Since the end of state socialism in 1989, the Roma have had permission to talk about our own culture and background. As a teacher my ability to speak Romanes allowed me to communicate with my Roma students. I was promoted to Assistant Principal, then Principal, and then was a lecturer at university. In my current position I have the opportunity to create viable educational structures especially for students from minority populations. As a child I learned Roma folklore; now I am able to incorporate those stories into Bulgarian textbooks and make the history of the Roma people a part of Bulgarian education." Marian Prokopov Petkov teaches hip hop dancing at the Montana Youth Center. He graduated from the New Bulgarian University, college of dance. In 2001, he began teaching hip hop and classical dance to a few students. He now has thousands of alumni some of whom have become profession dancers. "As a teenager, I was inspired by music videos and TV as well as street dancers. Started doing break dancing and popping. I was training in my bedroom at home. From age eighteen on, I began to dance in local discos." At present, Marian teaches over forty students in separate male and female dance groups at the Montana Youth Center. Marian also teaches in Sofia. Roma students are in the minority in both locales. Price may be a factor. Although lessons cost only about 7Є per month in Montana, that is an expense many Roma parents cannot afford in this high unemployment area. Marian would like to have his own dance group and be able to put own shows. "I have many dreams, but for me everything depends on luck and chance. At The Euro Hip Hop Championship in Slovenia, I saw many dancers with sponsorship money and resources that the Bulgarian government is unwilling to provide. Teenagers here in Bulgaria are interested in the same types of dance as the greater European teenage population." Marian's students range in age from six to early twenties. 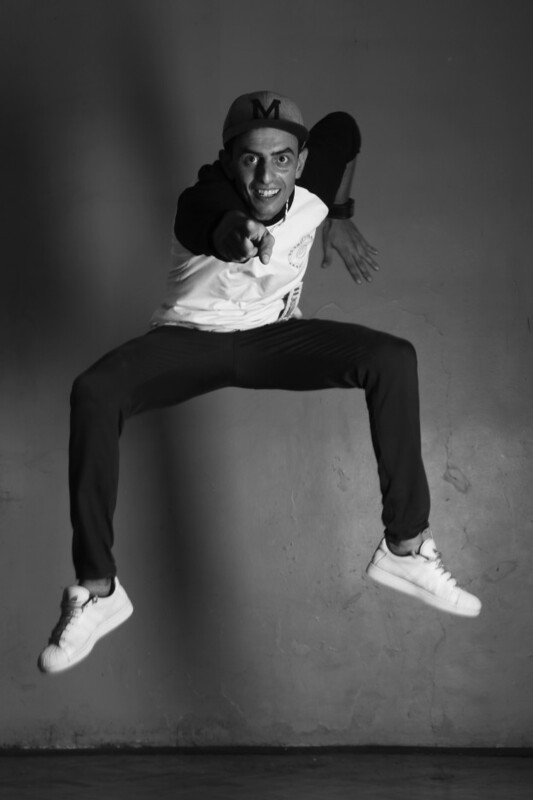 "I am teaching the next generation of dancers and building the hip hop audience in Bulgaria." Madame Spaska Jordanova Petrova, Deputy Minister in the Department of Labour and Social Policy, hails from the town of Vratsa in Northwestern Bulgaria. She has an MA in pre-school and elementary education; a second MA from Sofia University in Public Administration and is currently working on a third MA in Finance of Public Sector Institutions. Madame Petrova is married to a veterinarian and has a twenty-five year old son majoring in architecture. She credits her impressive political career to the unwavering support of her husband and parents. "This was my father's dream for me." Spaska's son was born soon after she graduated from secondary school and she was a stay at home mum for four years before beginning university. After graduation, she became a pre-school teacher. Then in 2003, after attaining her first MA, Madame Petrova was appointed Deputy Mayor of the Municipality of Hayredin. The duties of that job led her to recognize the need for an MA in Public Administration and subsequently, one in Public Finance. Deputy Minister Petrova's current portfolio focuses on social inclusion-implementing policies aimed at social and employment equality of persons regardless of gender, age, religion, or ethnicity. This includes administration of social benefits and welfare. "I grew up in a multi-ethnic community and was educated in integrated schools from elementary school on. However, knowing the life of many in the Roma community and visiting the Roma neighborhoods, impelled me to act as a role model for young Roma who live in the 'ghetto'- to give them inspiration to succeed and aspire to life as a professional. Most importantly to take their future into their own hands." "My inspiration is a confluence of forces leading to this point. I wanted to prove that a Roma woman could fill an important professional position effectively, make policy decisions, be assertive; and steer governmental policy onto the path toward social inclusion- especially to influence decision making at a local-grass roots level." "The success of my grass roots efforts with the Roma community is my greatest achievement- In 2010, a Roma beekeeping start-up 'Pchela' began in Hayredin with funding from OSI and the EU. Madame Petrova worked with the Bulgarian New Roads NGO to plan and organize the activities of this entrepreneurial endeavor in a region with the highest unemployment (79%) and the lowest wages (160 Є per mo.) in Bulgaria. "Pchela is a Spaska initiative." "I have reached my career goals by working for them and accepting the responsibility incumbent upon me. My greatest hope is that my son will exceed my career achievements. He is now a member of the student council in university. My dream is that my son will be able to fulfill his dreams." Viktoria Petrova is the first Country Coordinator of Roma background in charge of the REF Roma Scholarship Program- Bulgaria. Currently over 500 students per year apply for the scholarship and more than 200 are selected. The scholarship pays for only one academic year, so students must reapply on a yearly basis. Viki has a B.A. in Public Administration from Veliko Tarnovo University and an M.A. in International Relations from Sofia University. Previously, she was Bulgarian coordinator of the Roma Mentor Program directed by OSI (Budapest) -an innovative pairing of Roma mentors and non-Roma teachers which emphasized developing cross cultural educational networks and educating students about Roma history and culture. . "I have always believed that networking among students and educators is the key to addressing achievement gaps between Roma and non-Roma young people." The Open Society Initiative cancelled the program in 2011. Viki, herself, qualified for an OSI scholarship for Roma students, but found out about it too late. When she finally learned about the program at the end of her second year of university, she applied and was immediately accepted, but not before her parents had taken out a bank loan to put Viki and her brother through college. "Meeting Roma scholars was a revelation for me. For the first time I realized there were other Roma who thought like me, were educated and had economic goals." Viki created a pre-Facebook social network for Roma Scholars while at university. Viki credits her late father, Pietr Borisov, with inspiring her to continue her education and always pursue excellence. As part of the Bulgarian school desegregation effort, Pietr organized a concert featuring top Roma and non-Roma performers. "One day," her father told Viki, "you will understand why I go to homes in the Roma neighborhoods and encourage the children to go to school. One day those children will thank me." At his Memorial service, dozens of Roma students brought flowers to honor his memory. Viktoria dreams of a better Bulgaria for her daughter Ani - a nation that includes more opportunities for all Bulgarians and elimination of anti-Roma prejudice and discrimination. "When she was only two, non-Roma children refused to play with Ani, calling her 'a dirty Gypsy'". "Real change can only happen if other Roma who believe as I do are determined not to back down, and to strive for a world open to all." To do justice to the extensive career of Rumian Sergiev Russinov, one must begin with his initial source of inspiration, his father, Sergei who was co-chair of the Confederacy of Roma in Bulgaria, one of the first Roma organizations to gain prominence in the early 1990s, after the end of the communist period. 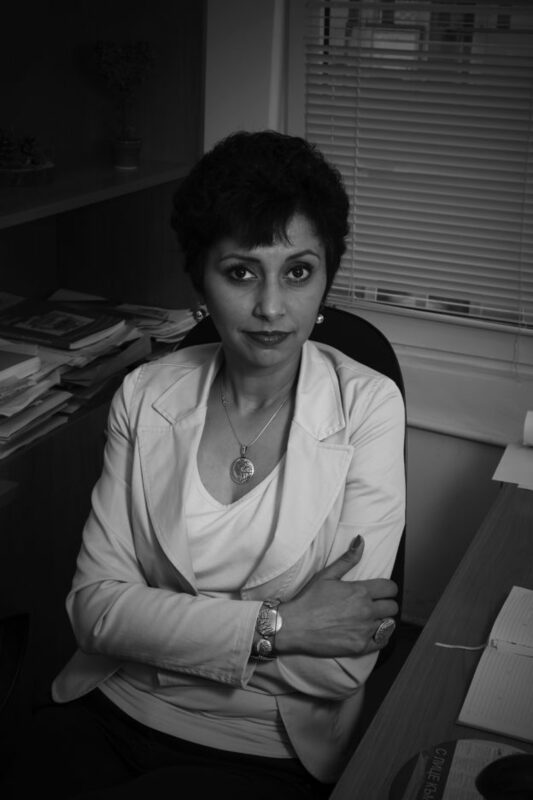 After completing an MA in economics from the International University in Sofia and an MA in political science from Sofia University, Rumian began working in 1993 with the Human Rights Project, a Bulgarian NGO advocating for Roma causes and documenting human rights abuses against Roma communities. From 1997 to 2000, the HRP actively engaged with Bulgarian governmental officials to bring about substantive policy changes in the areas of education, housing, health, social services and cultural diversity in employment. In 1999, The Framework Convention for the Protection of National Minorities was adopted as Bulgarian government policy despite objections from some MPs. 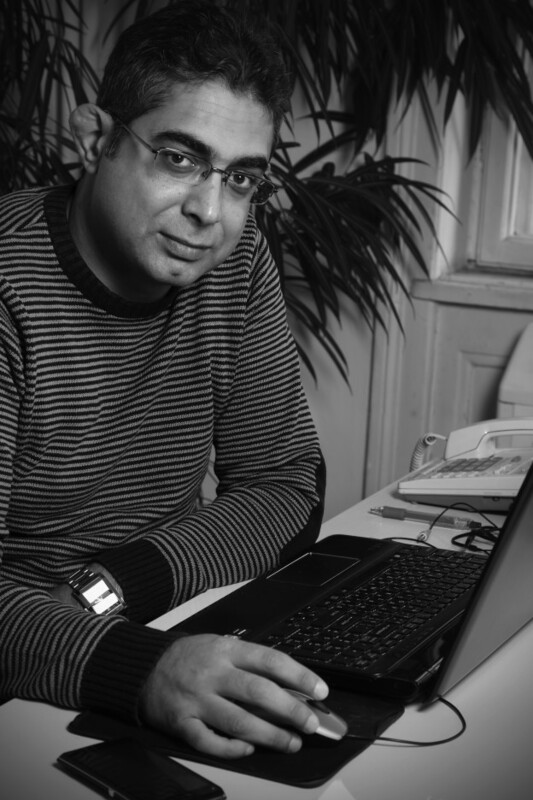 In 2000, Rumian became Director of the Open Society's Roma Participation Programme (Europe) based in Budapest. He moved to Hungary with his wife and son, to begin a decade long stint outside Bulgaria. His first initiative was to desegregate the Bulgarian school system. A group of 460 Roma children were integrated into public schools in an effort to demonstrate that Roma children do want to attend school and that their parents are eager for them to do so. The success of this trial led to the integration of over 20,000 Roma school children throughout Bulgaria and a governmental desegregation policy put forth in 2002. In 2003, the EU announced its Decade of Roma Inclusion (2005-2015) in part predicated on the success of Rumian's school desegregation initiative in Bulgaria. In 2005, Rumian became Deputy Director of REF (Roma Education Fund) in Budapest, bringing his Open Society experience to the REF setting. The Roma Memorial University Scholarship Programme has opened the door to higher education and professional opportunities for numerous Roma young people from Central and Eastern Europe. 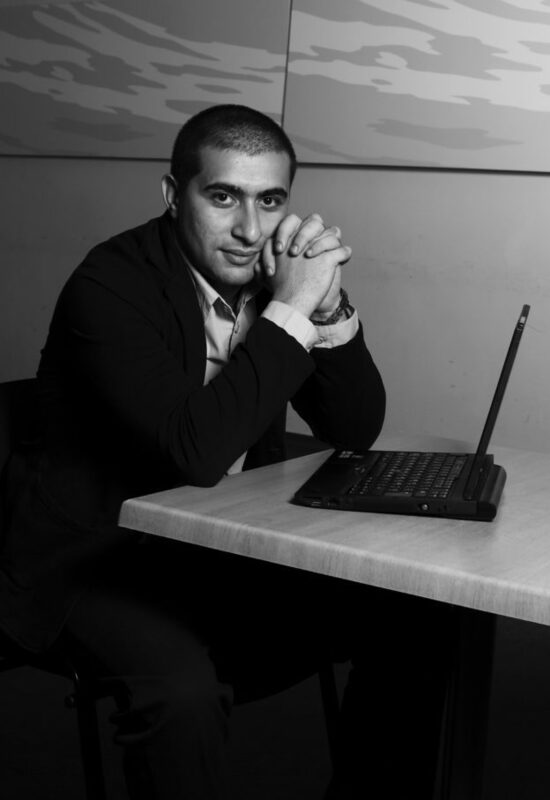 Upon his return to Bulgaria, Rumian became Director of the Arete Youth Foundation-a Bulgarian NGO with a mission to prepare Roma youth for higher education. His son, now sixteen, is preparing to study linguistics at university while his small daughter, Svetia, is preparing to enter kindergarten. Recently, Rumian has again taken up issues addressed decades ago. Sadly advances in human rights legislation of the past twenty years are being eroded by a lack of political will to implement policy initiatives and the disturbing rise in far right anti-Roma political parties throughout Europe. Concomitantly, there has been a sudden drop in funding for NGOs addressing Roma issues under the assumption that such funding will now be provided by EU sources. Considerable funds have indeed been allocated by the EU however "when such funds are earmarked to meet perceived needs identified by an NGO rather than the actual needs expressed by the Roma themselves, it is like buying a job lot of pens without a supply of paper." 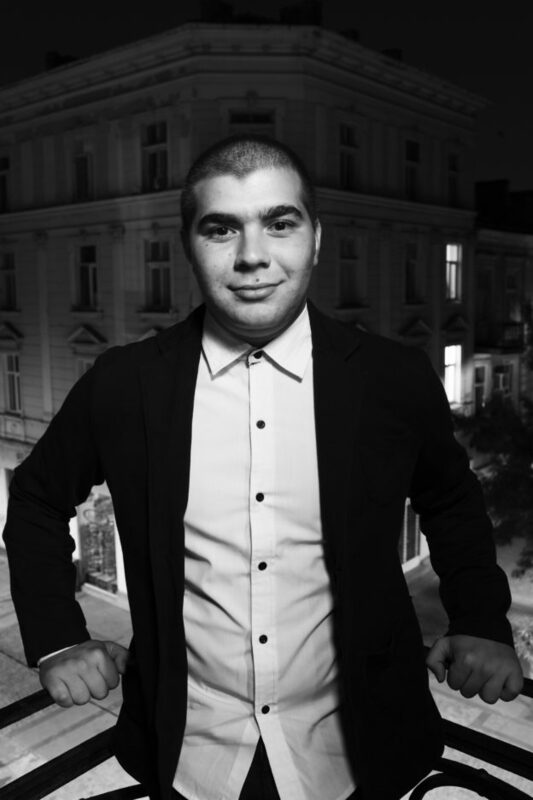 Asen Manchev Slavchev has recently received his bachelor's degree in electrical engineering from the Technical University, one of the most prestigious universities in Bulgaria. Asen is an only child, born and raised in the city of Plovdiv. His father and mother have been his inspiration and major financial support throughout his pursuit of this difficult technical subject. "Many other young Roma are entering university now and pursuing technical careers. I want to be part of this new generation." Asen has recently been hired by the Bulgarian State Agency for Metrological and Technical Surveillance (SAMTS). SAMTS is focused on promoting state policy in the field of legal metrology - market surveillance of technical products (including measuring instruments); technical inspection of high risk equipment; quality control of liquid fuels and designation of conformity to EU regulations. At twenty-three, Asen recognizes that he is already realizing his dreams. "As a child it was difficult to be Roma, but now, with my educational background I accept myself as part of Bulgarian society and am accepted by others as an electrical engineer who happens to be Roma." Tashko Tanov Tanov is Manager of the Montana Martial Arts Sports Academy. He lives in Montana with his wife, younger son and granddaughter. His eldest son lives in Germany where he is training children in martial arts. His younger son recently graduated from the National Sports Academy. 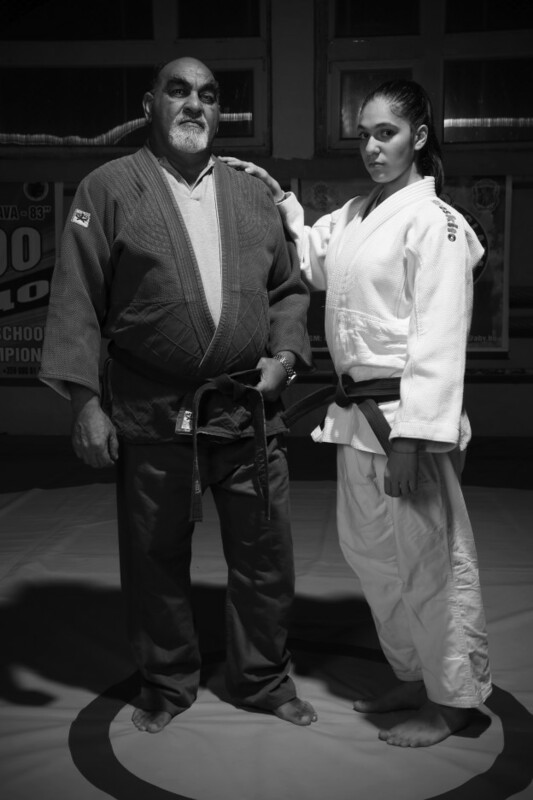 Tashko's granddaughter, Zdravka, is a National Champion in both Sombo (Sambo) and Judo. Tashko finished his studies at the National Sports Academy in 1981, and began his two years compulsory military service. During his service, Tashko learned Sombo wrestling, a Russian martial arts form. Tashko holds the highest level in Sombo of any practitioner in the Balkans. He has a Black Belt in Judo and won a bronze medal in Sumo wrestling. In total, Tashko has won about 44 medals at the European and world levels and over a thousand medals at the Bulgarian National Level. In 1983, Tashko opened a Martial Arts School in Montana. Under communism, most martial arts training was not allowed-Judo and Karate were seen as Western sports. Wrestling was allowed, however Sombo was preferred because it is a Russian sport. Only the children of high ranking officials were allowed to study the other martial arts. After the fall of the Communist regime, Tashko was able to train students in all martial arts, but had to face anti-Roma prejudice. Montana municipal officials did not support his school or his students. Despite being an integrated group of Roma and non-Roma, the first class of Judo students had to practice outside on the grass as no facility would accept them. "I understand the meaning of 'masculine tears,' Tashko commented, because I have had to see my way through such difficult struggles to ensure that my school succeeds." Some non-Roma trainers made remarks such as "so you are going to teach Gypsy Judo?" However parents of both Roma and non-Roma students view the record of medal winners and honored athletes who have trained with Tashko and celebrate their achievements by enrolling their children in the academy. Nonetheless, a wider lack of financing continues to hamper Tashko's efforts to take teams of students to competitions outside Bulgaria. Local government funding has dried up because there is a perception that Roma entrepreneurs are receiving corporate or NGO financing. "I keep going, despite these obstacles, because I love the kids and martial arts. I would like to build a sports center here in Montana and create a sports hostel where athletes could stay after competitions. Luckily I have the consistent support of my wife. She has always backed me up regardless of the difficulties I've encountered in fulfilling my dreams." 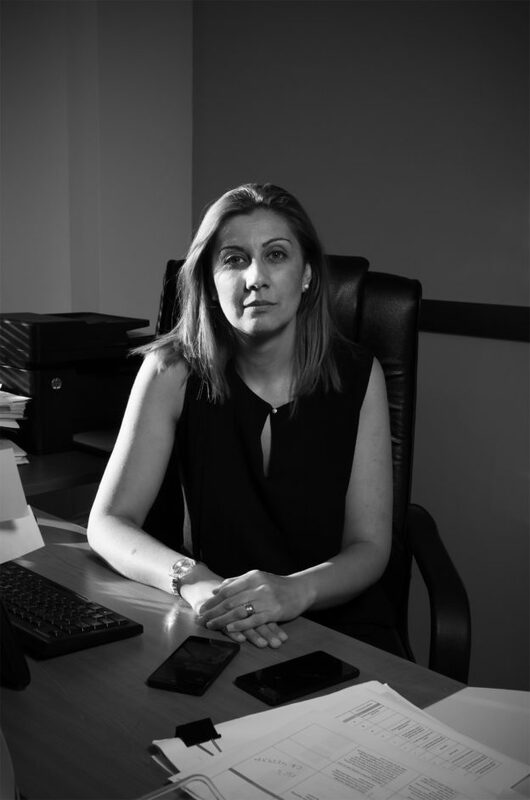 Zina Tenekedzhieva is a Senior Expert in Regional Development, Administrative Control, and State Property for the Haskovo Region of southern Bulgaria. Zina was born and raised in Haskovo in a family of three sisters and one brother. During Soviet times, Zina's family were metal workers. Zina's father's family are traditional musicians; her father plays accordion, piano, and guitar. His repertoire includes both ancient Thracian melodies and traditional Roma music. "Most of our family has lived in Haskovo for generations." Zina is a single mother. Her daughter, Liliana, is now six and a half. Following Roma tradition, Liliana is named for her maternal grandmother. As a child, Zina and her friends walked to school together every day. All wished to continue their education after high school and would encourage and support each other to maintain that objective through disappointments and setbacks. As her sisters and brother married immediately after high school, they were unable to help with tuition. Zina went to work in manufacturing in order to afford to attend university. Zina first attended Thracian University in the city of Stara Zagora and then transferred to the university of St. Cyril and St. Methodius in Veliko Tarnovo where she obtained her undergraduate degree. Zina completed a MA in Public Finance at the University of National and World Economy in Sofia. After mastering English through a programme of studies offered at American University, Zina was selected as an intern in General Administration, Education, and Culture with the European Commission based in Brussels. Among her recent accomplishments, Zina highlights her work as a Regional Coordinator for the Areté Youth Foundation. "This position has given me the opportunity to work with Roma young people ages fourteen to thirty-five." Areté presented a motivational seminar at the beginning of the school year in September 2016 urging Roma youth to pursue post-secondary education. "Dream! Overcome barriers! The barriers are only in your mind." 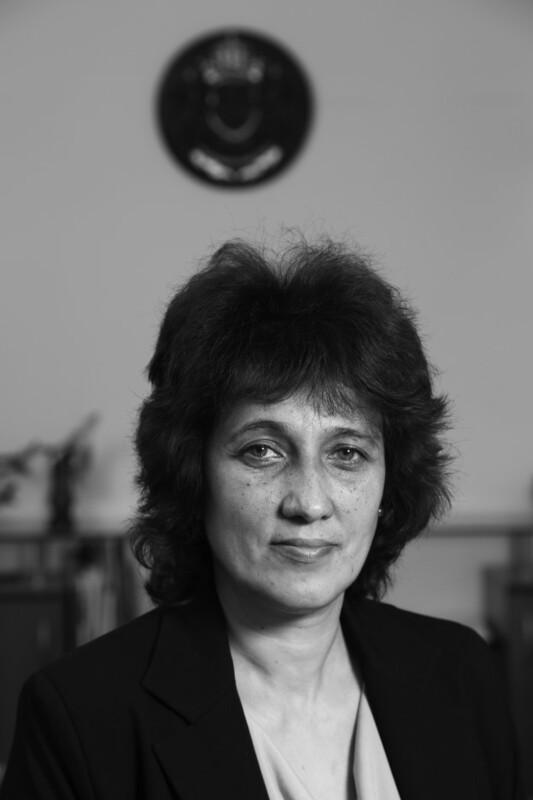 Zina's current position as Senior Expert for the Haskovo Region does not call upon her to work specifically with Roma. Projects incorporate all residents of the area. Zina may be approached to act on behalf of an individual in one instance; at another time the initiative may involve all who live within a particular municipality. "From childhood I have dreamed of building a better world and have acted to make those dreams a reality. As a businessperson, I understand that one can gain much or nothing from university seminars and corporate meetings. I take from each encounter what I need to enrich my understanding." "I'm not exactly sure why I decided to become an actress. By the time I was ten I already knew this was the career for me." 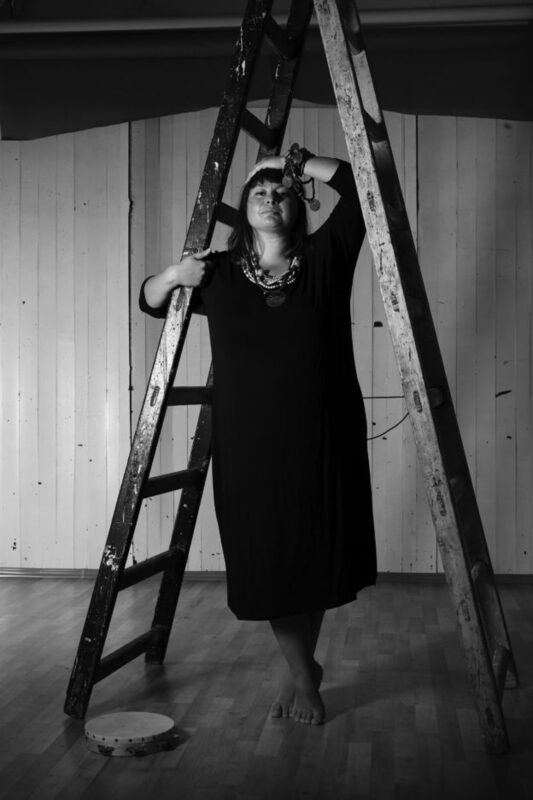 Nataliya Tsekovo is a free agent, and has appeared in productions for several major theatre companies in Bulgaria. She played Aristophanes in a Midsummer Night's Dream and had several roles in Edward Albee's Who's Afraid of Virginia Wolfe. Nataliya considers her role as a twelve- year boy in Lord of the Flies to be the most challenging, yet most satisfying to this point. "Perhaps because I come from a family of performers. My great grandfather played clarinet. He was a creative genius, wrote his own songs, played with a traditional Roma orchestra at weddings and Roma celebrations such as Ederlezi, the feast of Saint George." Nataliya was born in Elin Pelin, a small town near Sofia. Her mother is a dressmaker and her father owns a small vegetable garden. She attended elementary school in Lesnovo where her sisters and cousins live, and secondary school in Elin Pelin. In 2014, Nataliya graduated from the National Academy for Theater and Film in Sofia. Currently Nataliya is writing a screen-play, "I intend it to be a monologue," exploring various aspects of the identity of Roma women in Bulgaria, "both historically and in the present context." She hopes to put the play into production by 2017. Although not certain of her future plans, Nataliya is adamant that she will remain a working actress. Yuksel Yasharov was a city council representative for the town of Peshtara in South Central Bulgaria for two terms. 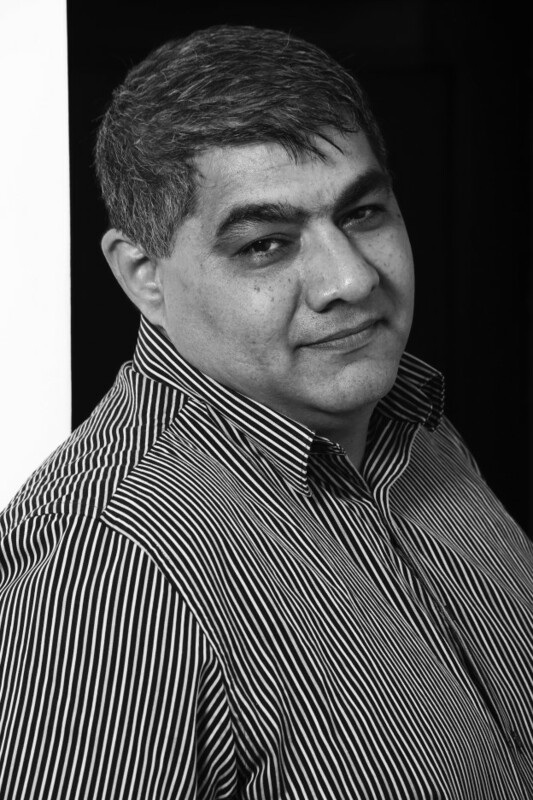 Born in 1969, and raised in a Muslim Roma family, Yuksel attended secondary school in nearby Batak, and in 2016 completed a degree in social work from the New Bulgarian University, Sofia. He is married with two children; his daughter graduated from the agricultural university in Plovdiv while his son finished secondary school in 2016 with an emphasis on the hospitality industry. His wife, Feliza, who is also from Peshtara, is of Turkish background. Yuksel cites training in policy management provided by the Washington, DC based, National Democracy Institute, (www.ndi.org) as providing key skills such as public speaking, campaigning, and organizational strategies necessary to a career of public service. Before entering municipal government, Yuksel was a building contractor. Through his work, Yuksel became keenly aware of discriminatory housing policies, which relegate Roma to segregated neighbourhoods. Roma have not been welcomed in cafes or shops outside their own 'mahala.' NDI gave Yuksel the motivation to work for change, and the tools needed to affect positive policy initiatives. Since 2007, the Roma have been allocated two places on the Peshtera City Council. Yuksel's first action as a city council member was to create a directive against discrimination and to promote civil rights throughout the Peshtera region. The mayor followed through on the recommendations and levied fines on those businesses, which continued discriminatory policies. Thanks to the mayor, discriminatory housing policies have almost been eliminated from Peshtera. Nonetheless, there are still two segregated schools in town, one kindergarten to fourth and the second, fifth through eighth grade. On a positive note, Peshtera schools offer bilingual education: Romanes-Bulgarian and Romanes-Turkish. A complicating factor in the housing situation is that many Roma do not possess deeds proving their ownership. Houses deemed to have been built illegally, are currently being torn down, and residents of the former 'mahala' are now on the street. This catastrophe has pushed some Roma from the region to leave Bulgaria. 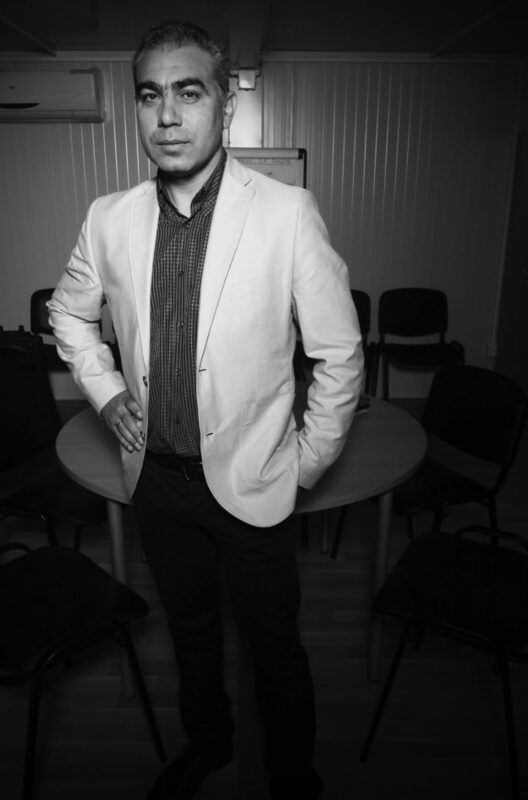 At present, Yuksel, through his position as coordinator of the Trust for Social Alternatives under the auspices of the America for Bulgaria Foundation, is actively working on remedying the Roma housing crisis. A project he put into operation engages local authorities in framing the municipal legislation necessary to provide deeds of ownership to Roma families. Yuksel was voted off the Peshtera city council in the 2016. He attributes this loss to his anti-discrimination activism especially regarding housing and education. His family even received anonymous threats during the recent campaign season. 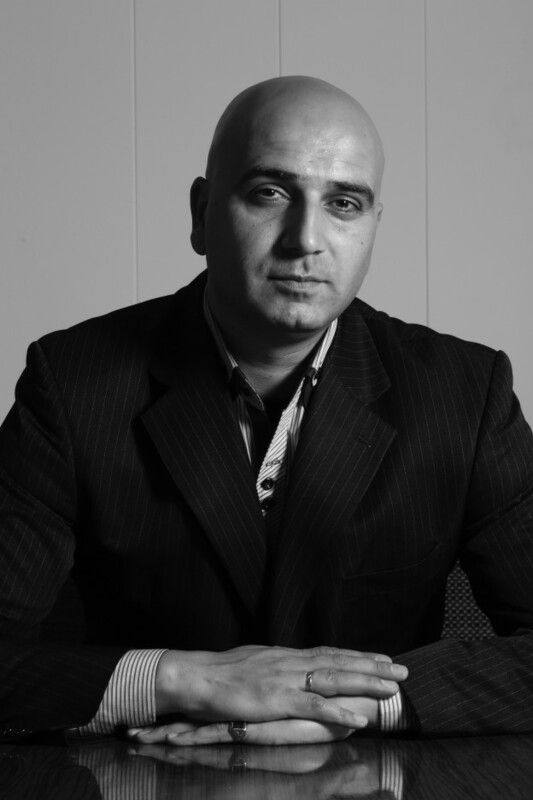 Yuksel is now a facilitator for the Council of Europe in municipalities surrounding Peshtera. He acts as a conflict mediator with an aim to increasing Roma participation at the community level in disputes over Roma integration and inclusion. As a Muslim Roma, Yuksel is also able to address issues of discrimination against Muslims, which is widespread in Bulgaria. "Faced with double discrimination, many Muslim Roma do not admit their Roma ethnicity. Additionally, Romanes speaking Roma do not always recognize Muslim Roma as Roma. Regardless, both groups face similar social challenges and problems with integration into mainstream Bulgarian society. Effective policy change at a national level is imperative to ameliorate segregation and discrimination toward the Roma, Muslims and other minority groups in Bulgaria." Ludmila Petrova Zhivkova, filmmaker and Director of a Roma NGO, "Student Society for the Development of Interethnic Dialogue," has always been interested in historical research. While studying film making at Sofia University, she became aware of the lack of historical information about the Roma and the Roma Holocaust in particular. "My own grandmother lived in a Jewish neighborhood here in Sofia during the second world war. Bulgarian authorities warned Muslim Roma families that unless they changed their names and converted to Christianity, they would be deported along with the Jews." Ludmila is currently seeking funding for a documentary film featuring survivor testimonies. Ludmila credits her teachers at the National Art Secondary School for encouraging her to pursue higher education. She was even accepted to the Royal Academy of Fine Arts in Vienna, but could not afford to attend. Through the Student Society for the Development of Interethnic Dialogue, Ludmila now has an opportunity to mentor young Roma and provide them with tools to meet their own educational goals. Her dream? To produce a feature film, "Children of the Wind" tracing the initial path out of India taken by the Romani people.